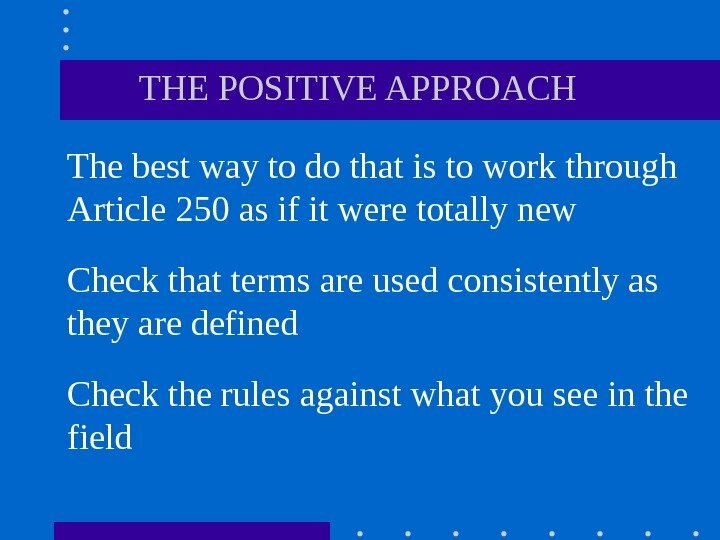 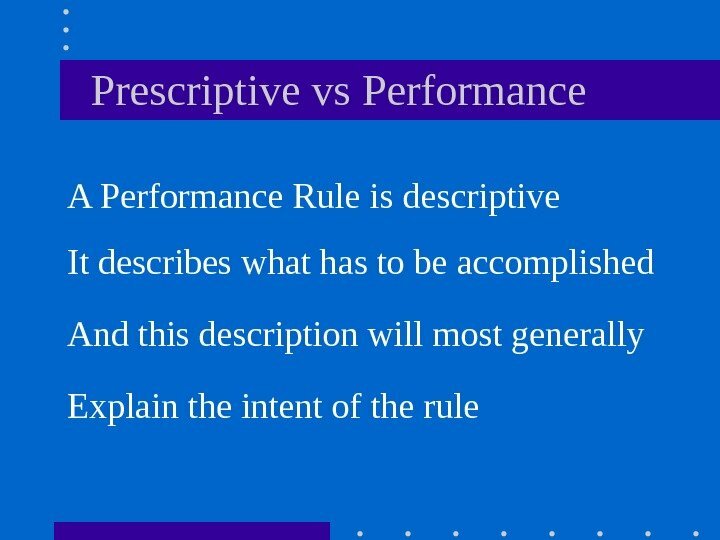 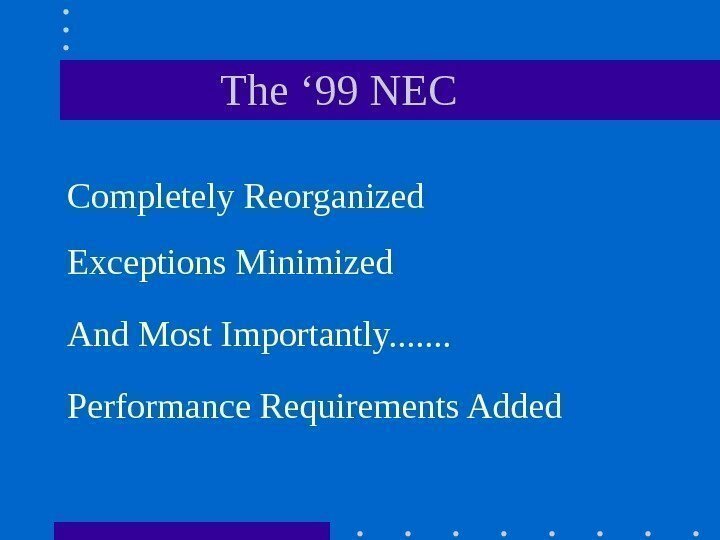 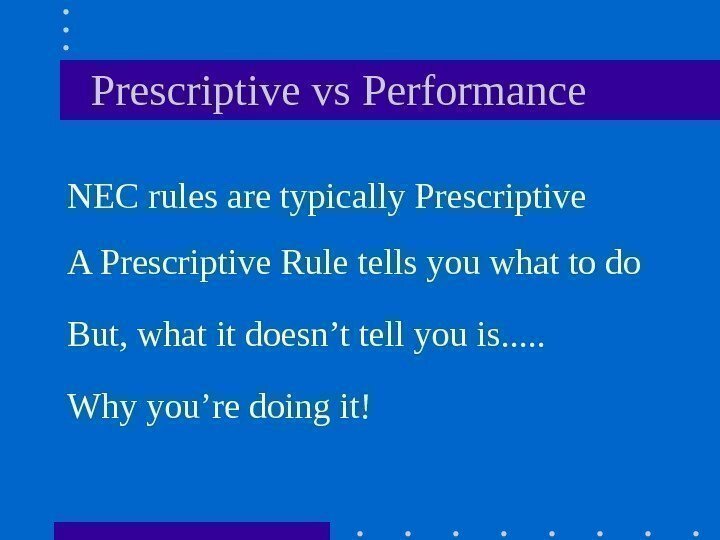 Prescriptive vs Performance NEC rules are typically Prescriptive A Prescriptive Rule tells you what to do But, what it doesn’t tell you is. 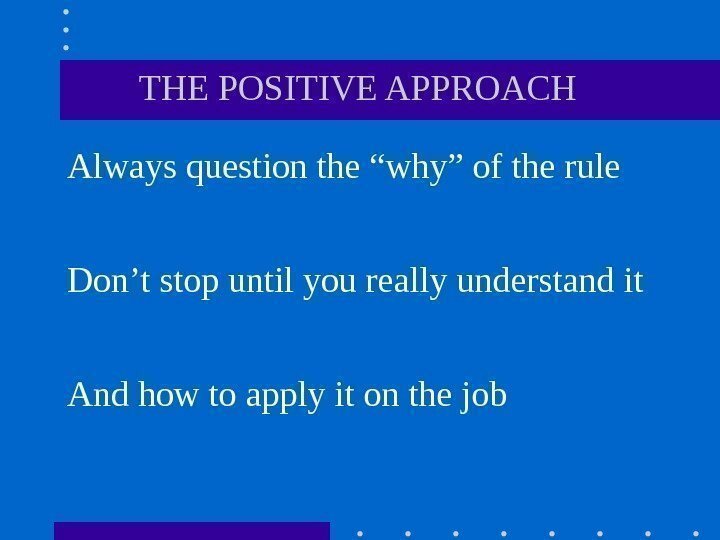 . . Why you’re doing it! 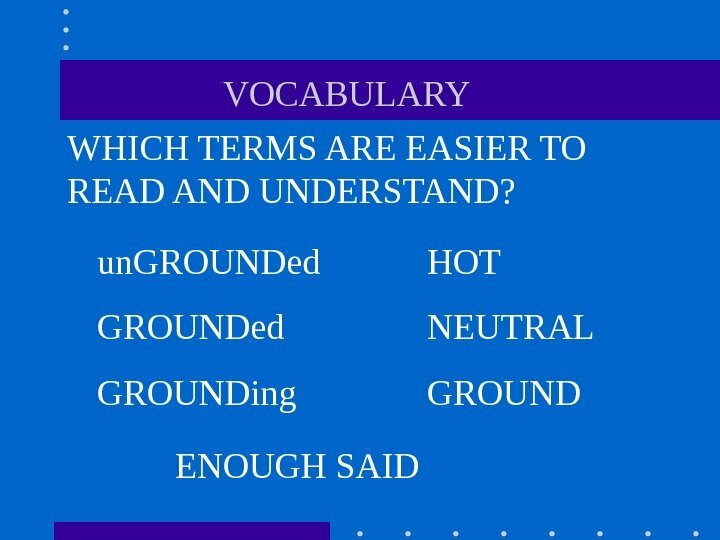 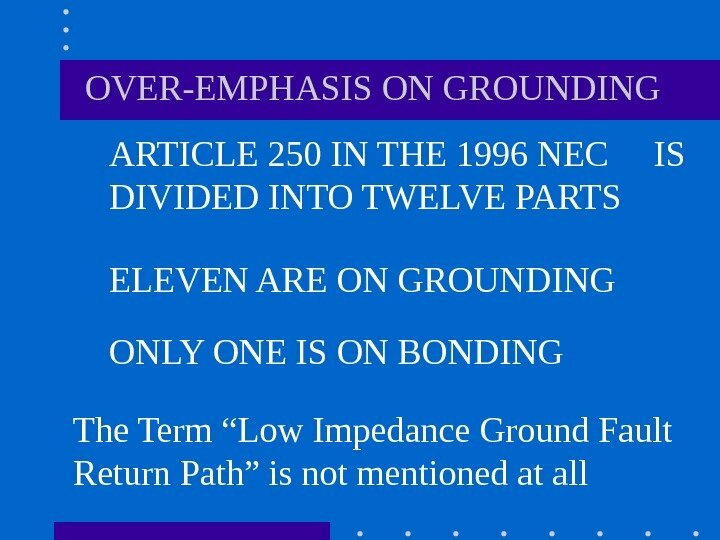 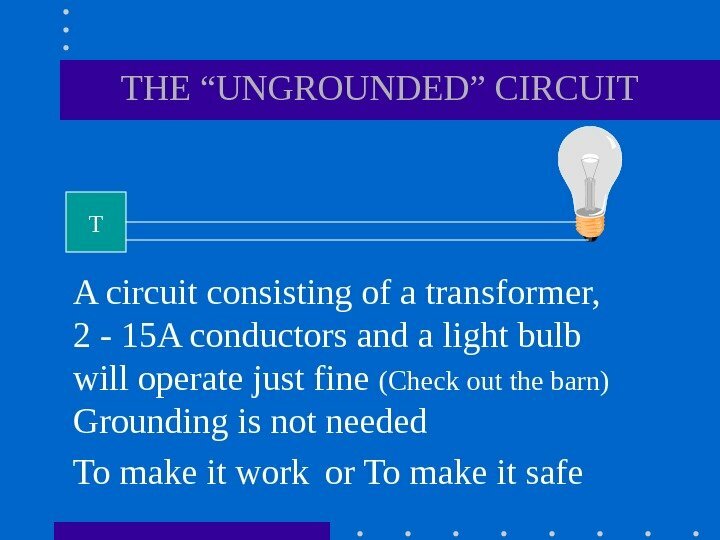 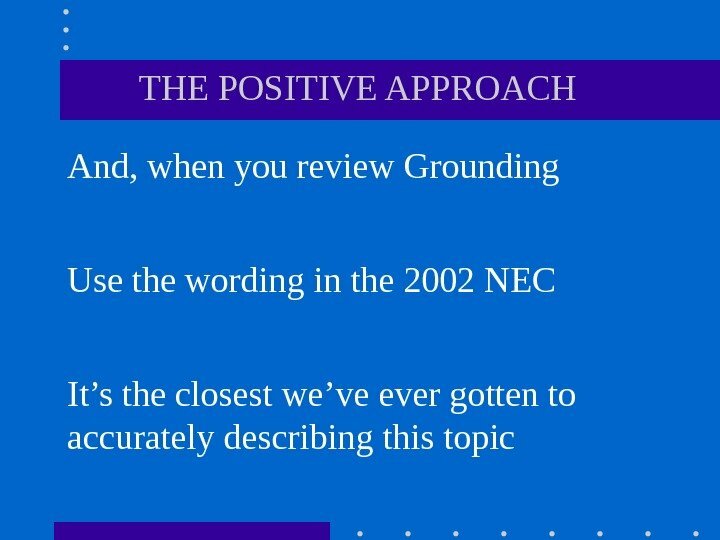 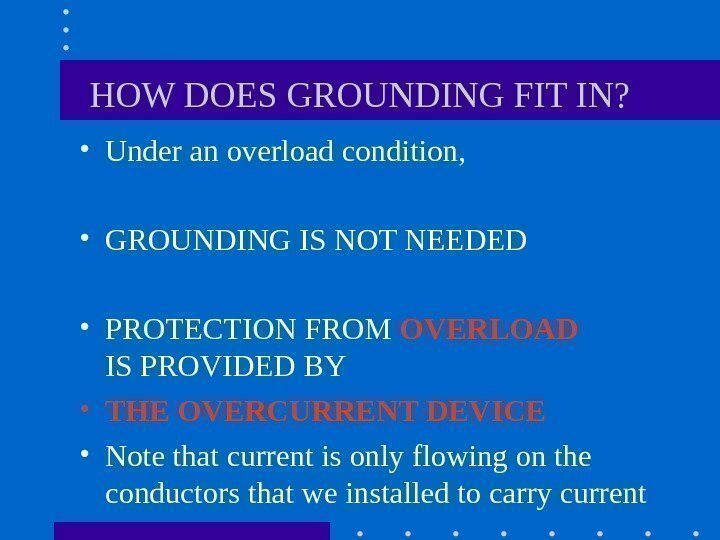 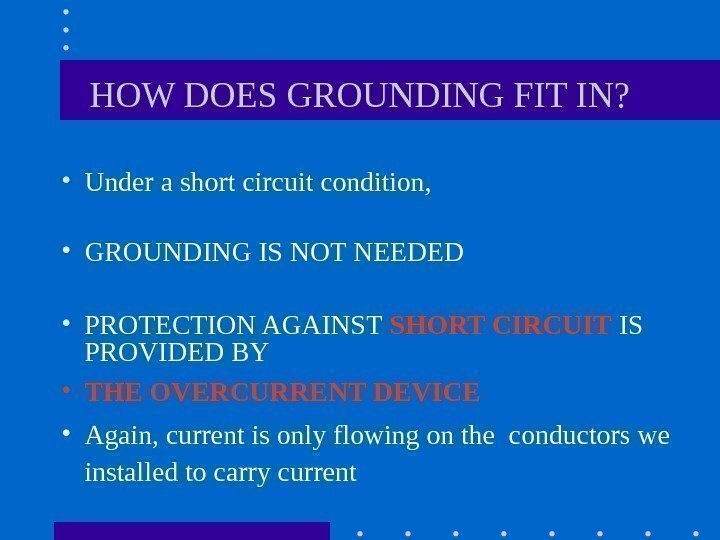 HOW DOES GROUNDING FIT IN? 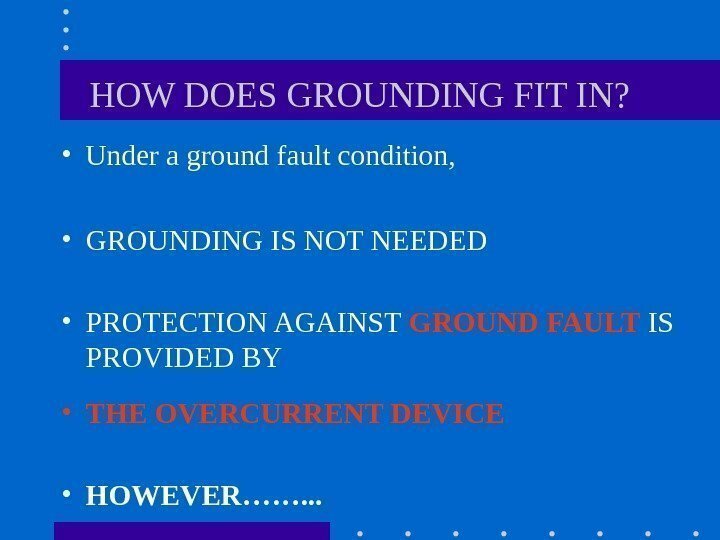 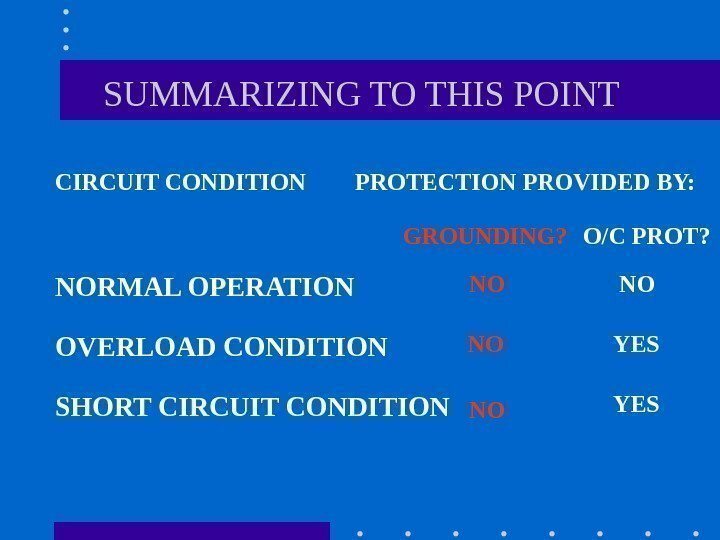 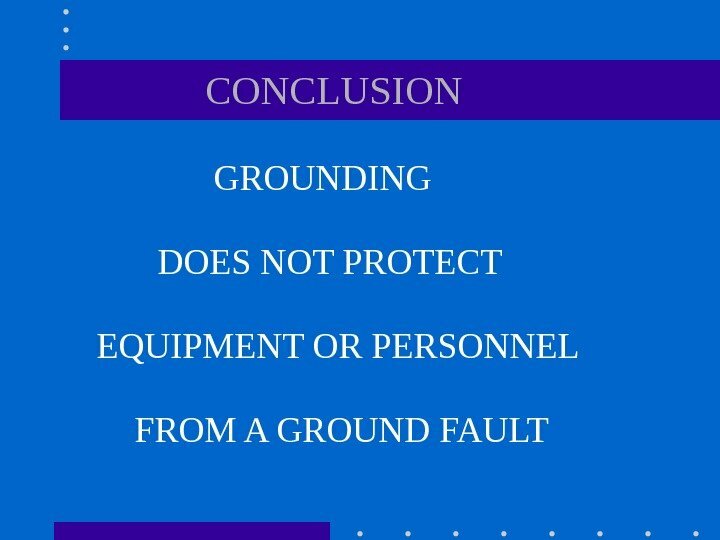 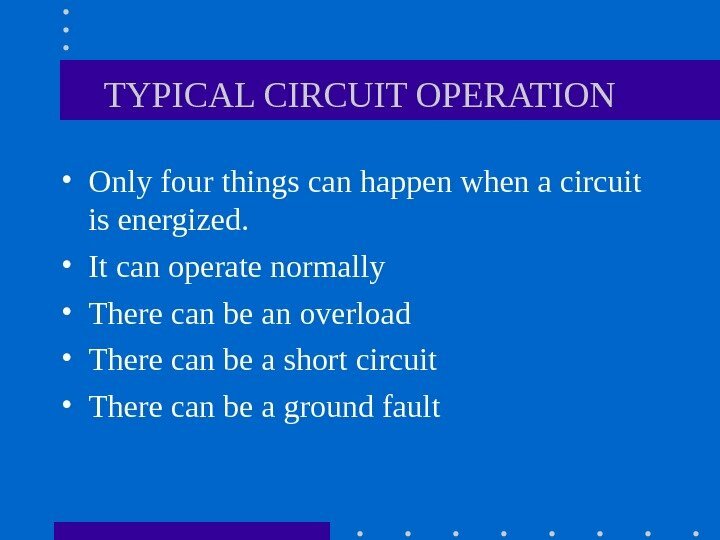 • Under a ground fault condition, • GROUNDING IS NOT NEEDED • PROTECTION AGAINST GROUND FAULT IS PROVIDED BY • THE OVERCURRENT DEVICE • HOWEVER……. 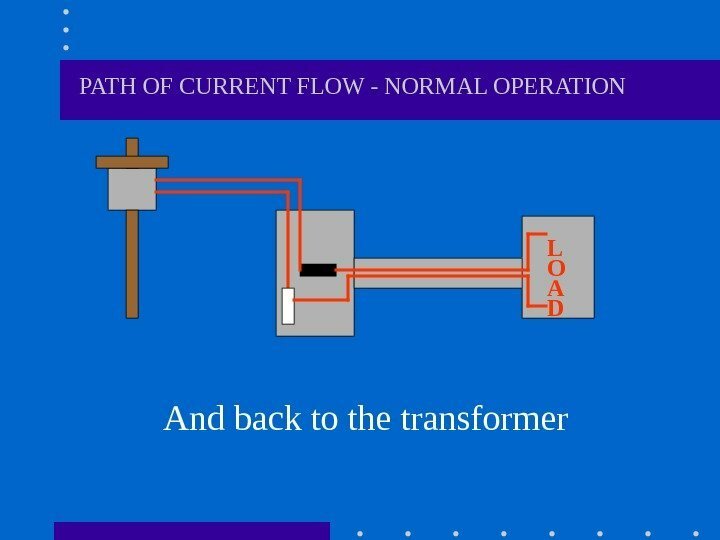 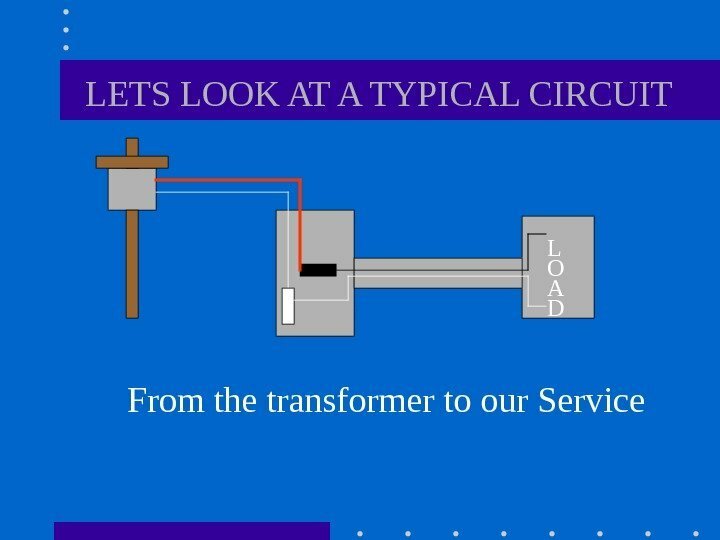 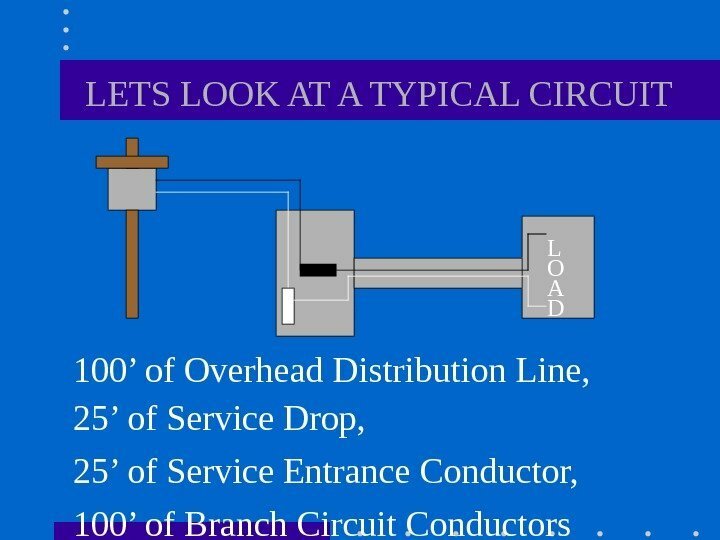 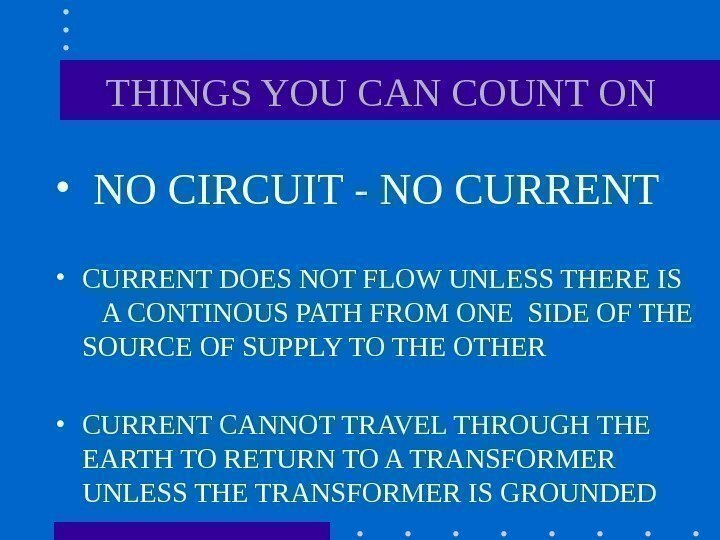 . .
L O A D LETS LOOK AT A TYPICAL CIRCUIT Current flows…. . .
L O A D GROUND FAULT CONDITION And our friend comes along and touches it? 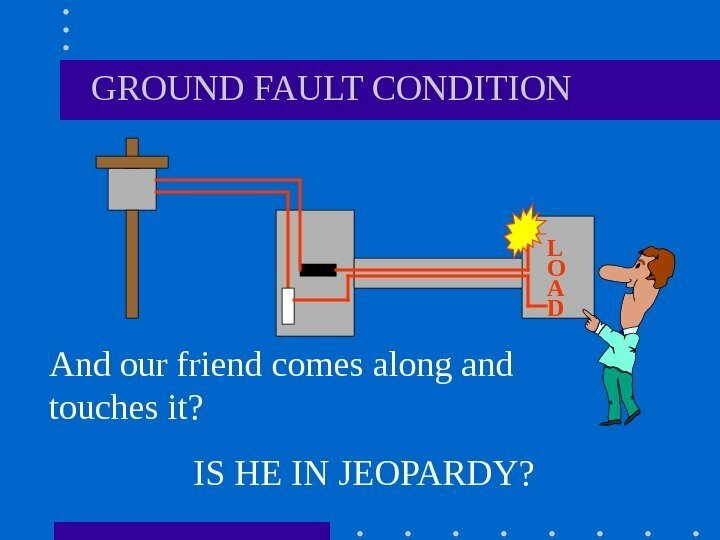 IS HE IN JEOPARDY? 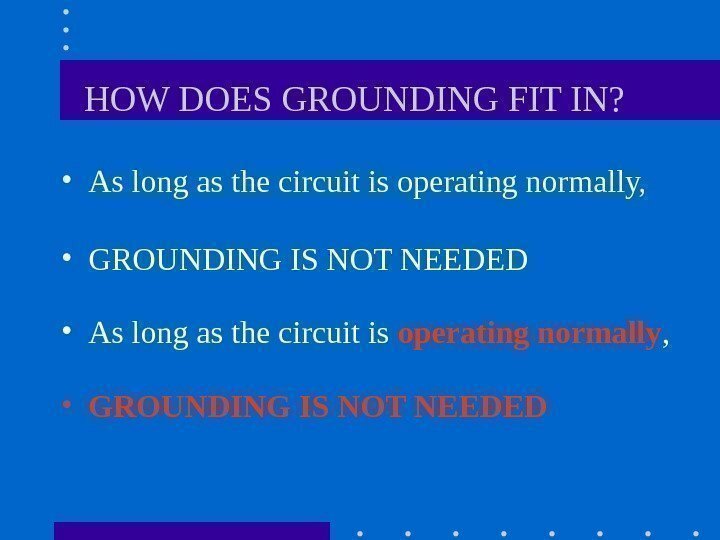 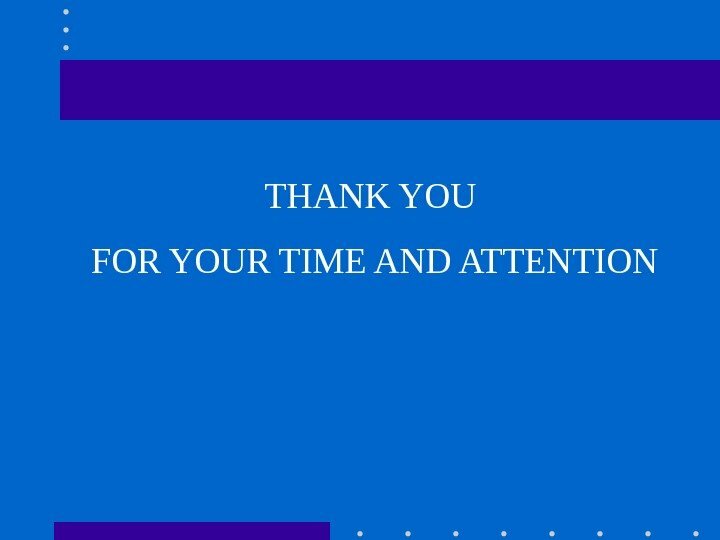 SO WHY ARE THEY GROUNDED? 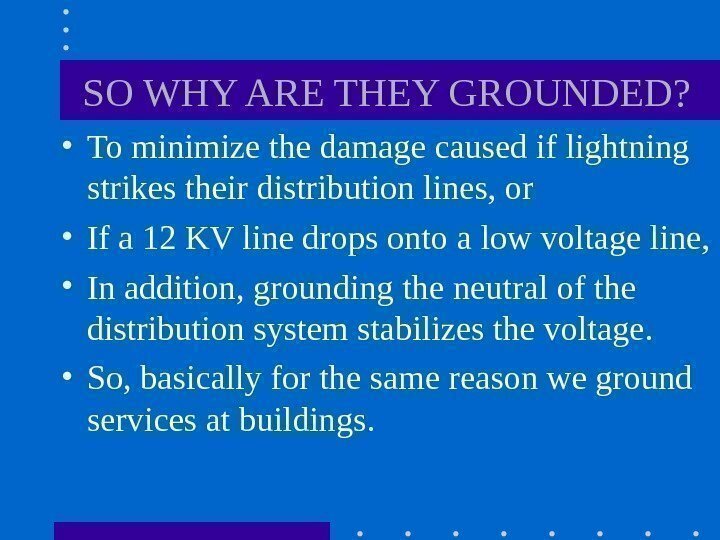 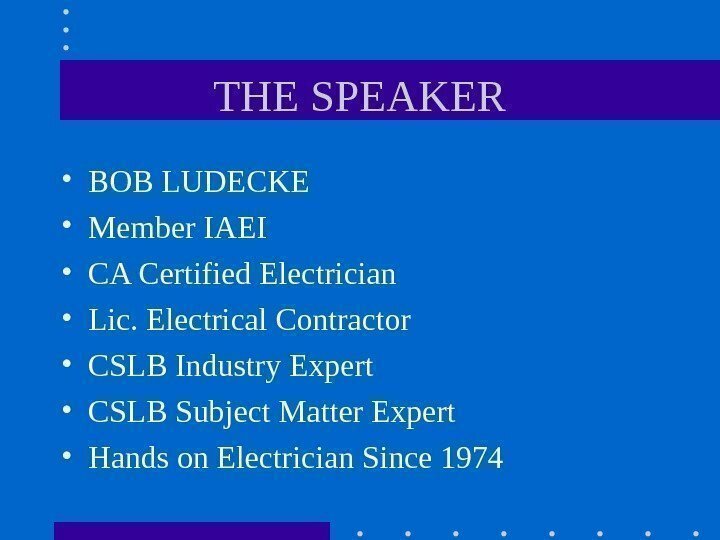 • To minimize the damage caused if lightning strikes their distribution lines, or • If a 12 KV line drops onto a low voltage line, • In addition, grounding the neutral of the distribution system stabilizes the voltage. 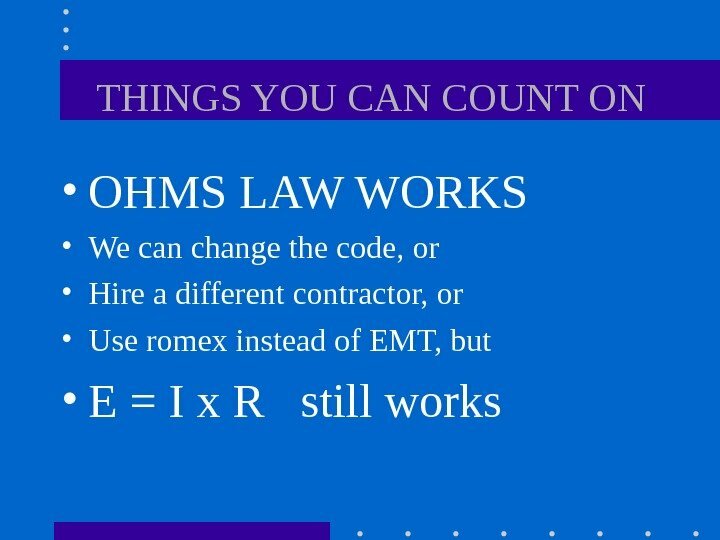 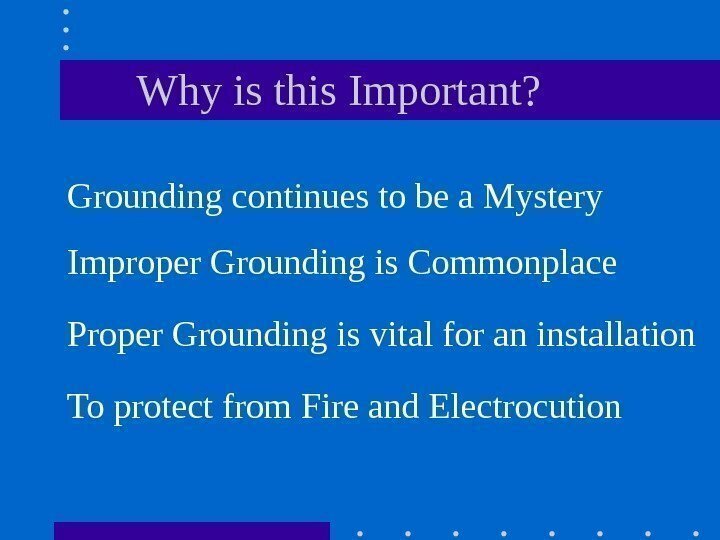 • So, basically for the same reason we ground services at buildings. 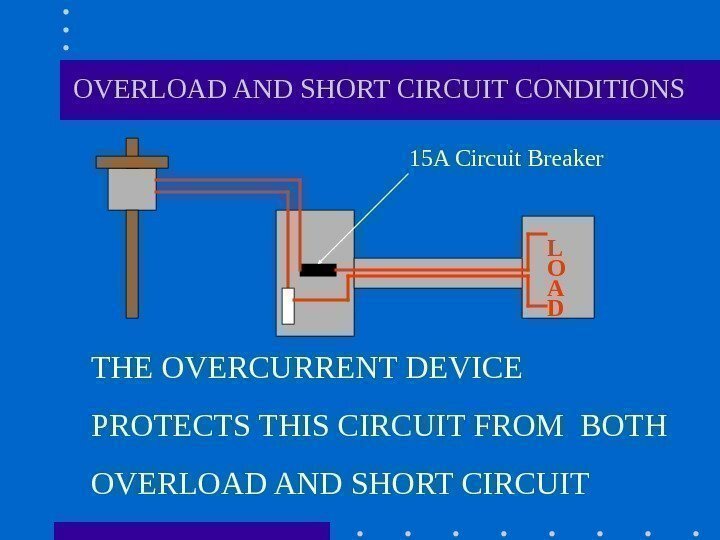 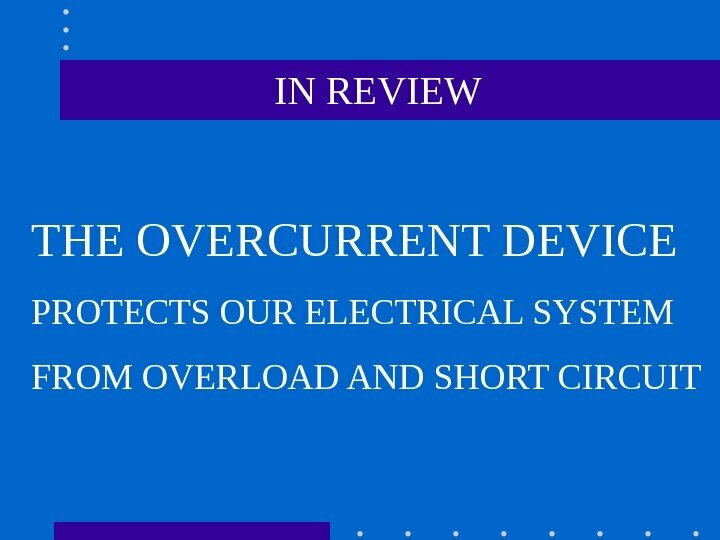 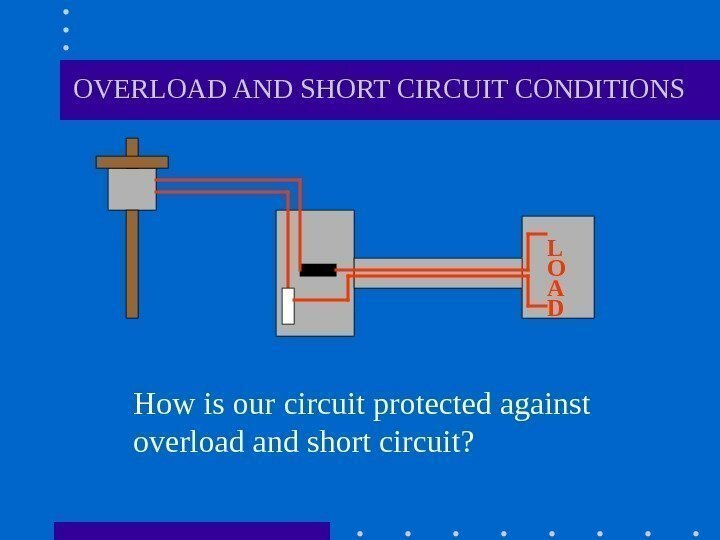 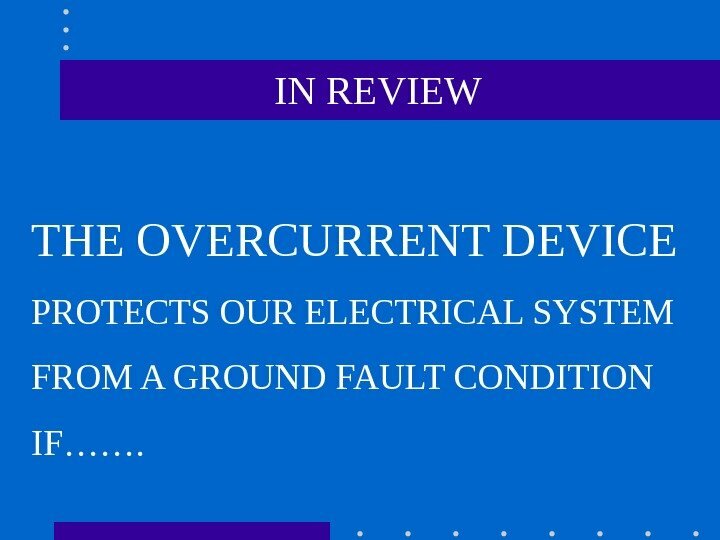 IN REVIEW THE OVERCURRENT DEVICE PROTECTS OUR ELECTRICAL SYSTEM FROM A GROUND FAULT CONDITION IF……. SO WHAT’S THE PROBLEM? 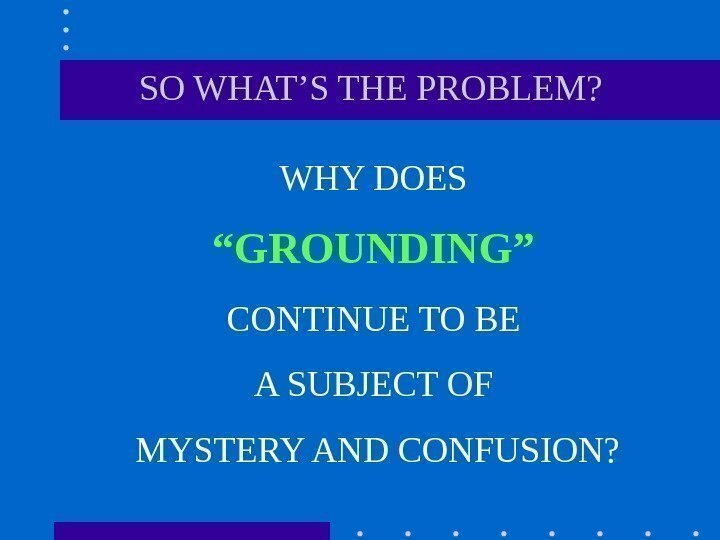 WHY DOES “ GROUNDING” CONTINUE TO BE A SUBJECT OF MYSTERY AND CONFUSION? 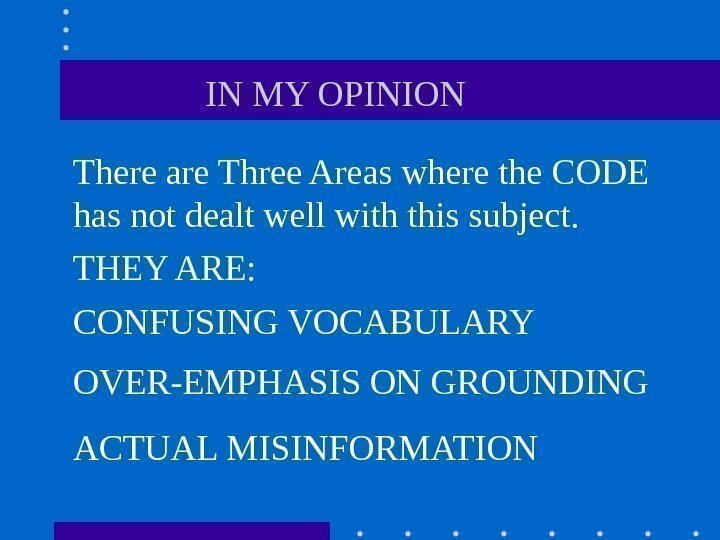 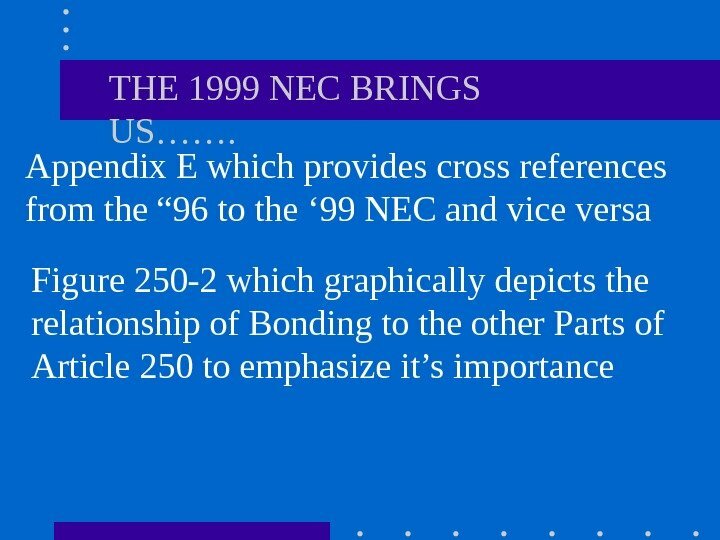 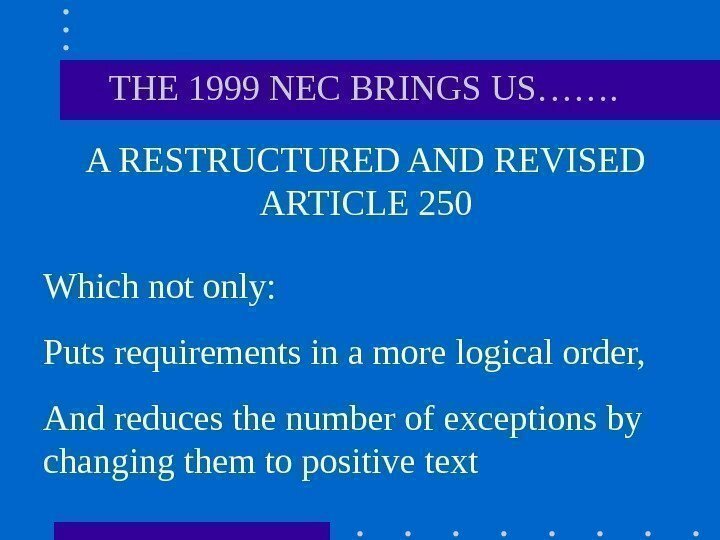 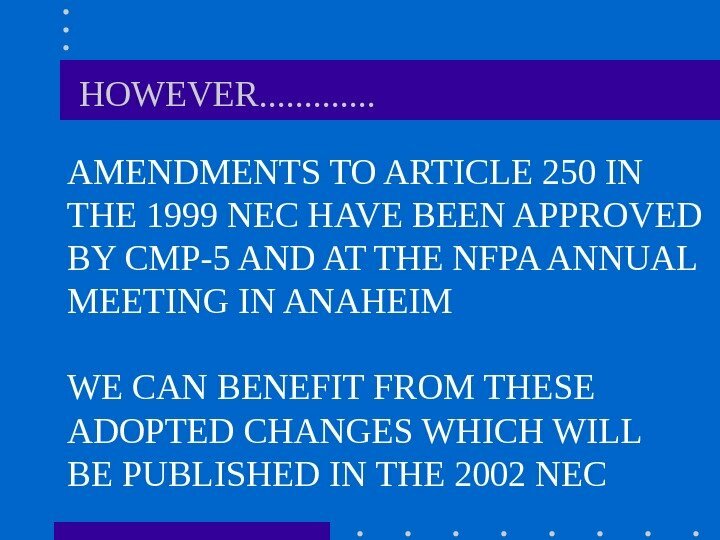 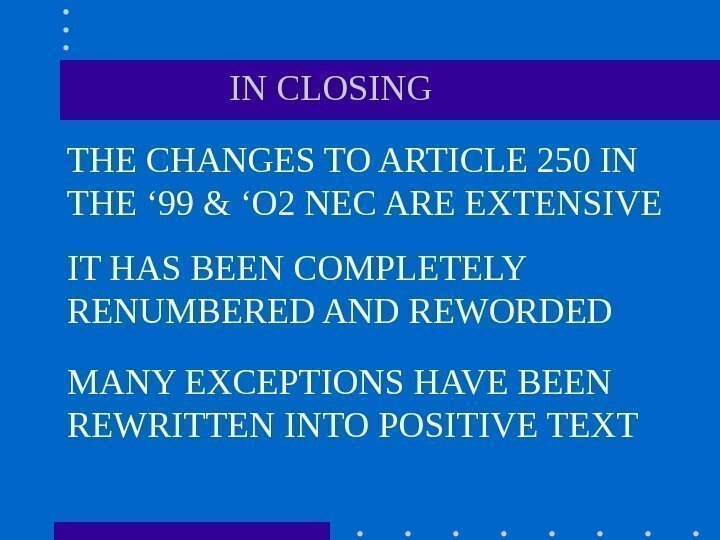 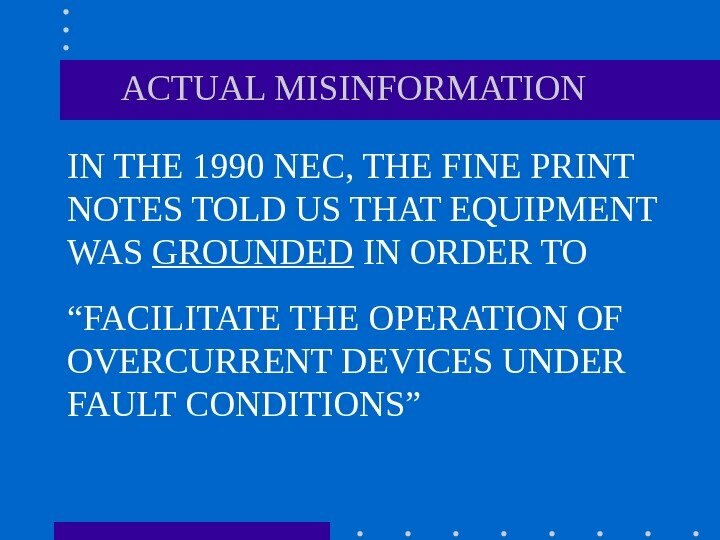 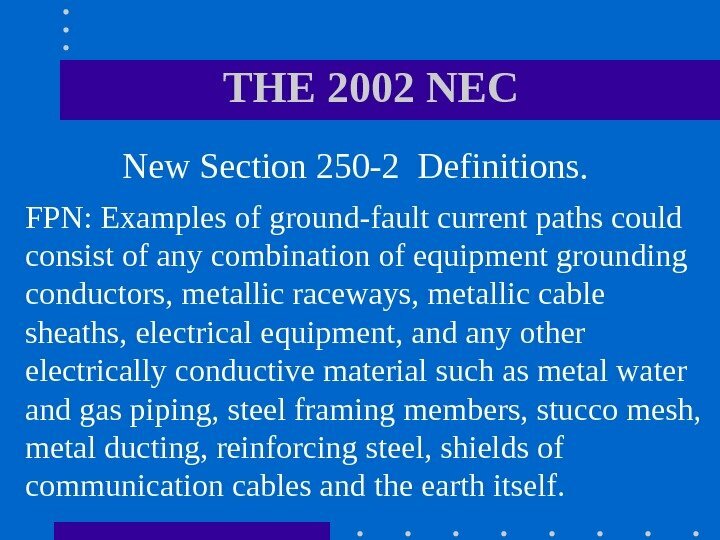 THE 2002 NEC New Section 250 -2 Definitions. Ground Fault. 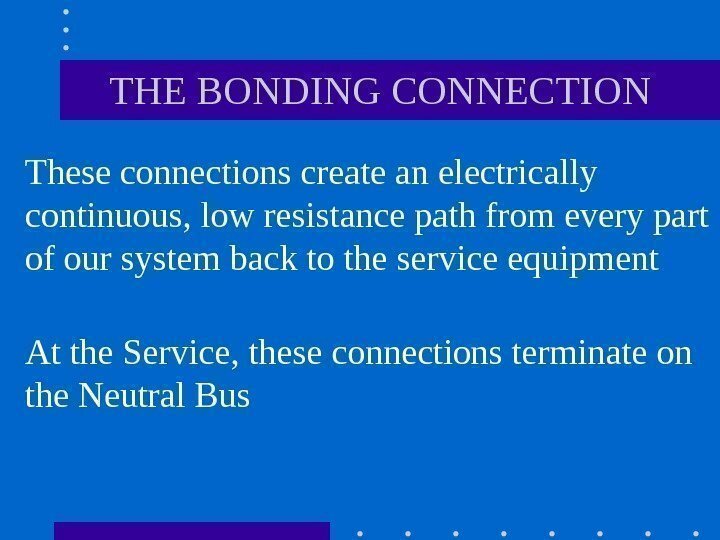 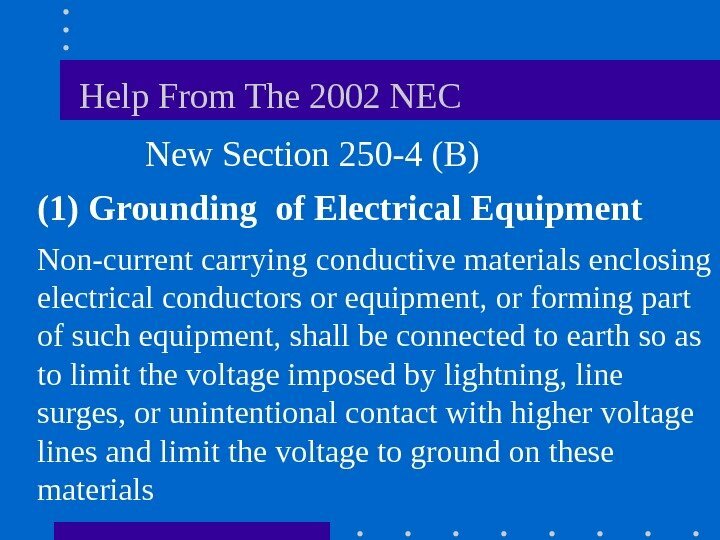 An unintentional, electrically conducting connection between an ungrounded conductor of an electrical circuit and the normally non-current carrying conductors, metallic enclosures, metallic raceways, metallic equipment or earth. 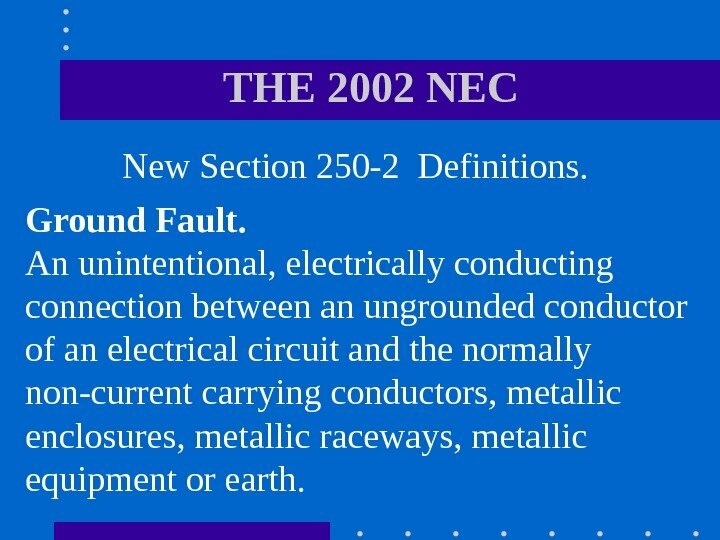 THE 2002 NEC New Section 250 -2 Definitions. 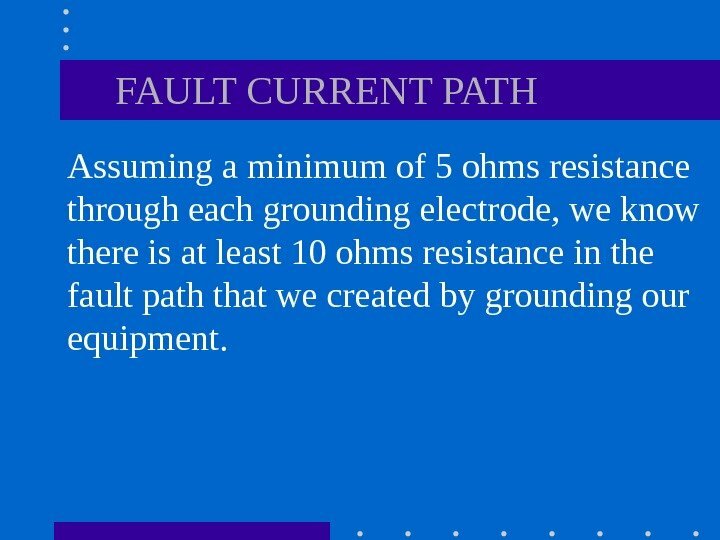 Ground-Fault Current Path. 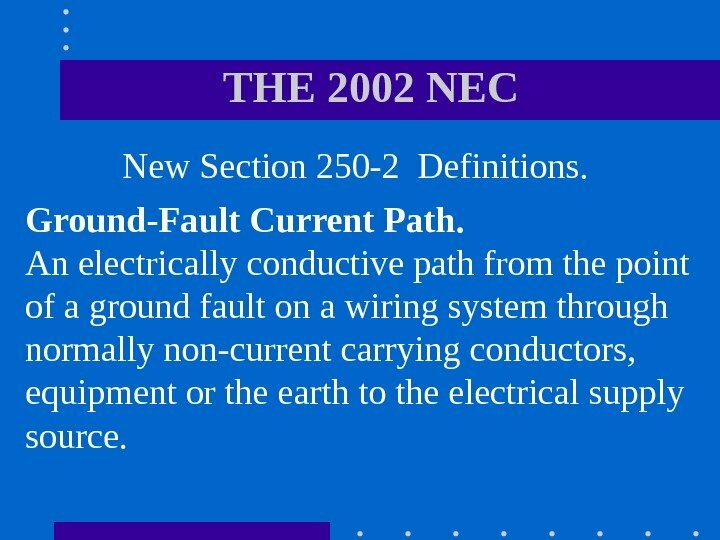 An electrically conductive path from the point of a ground fault on a wiring system through normally non-current carrying conductors, equipment or the earth to the electrical supply source. 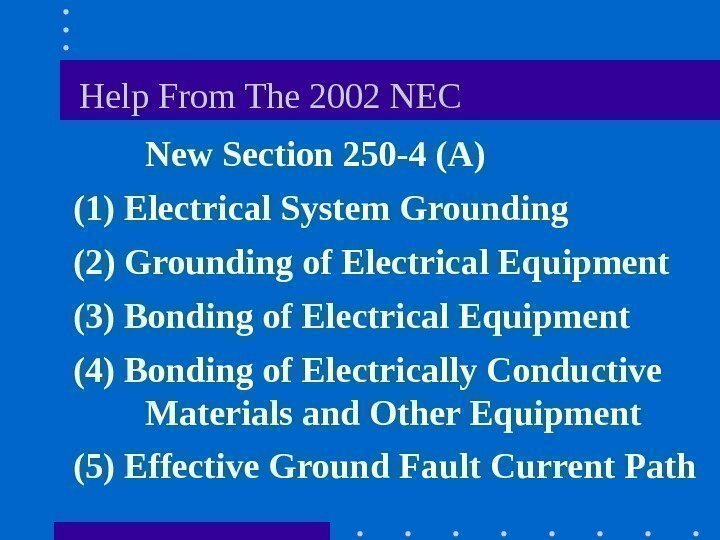 THE 2002 NEC New Section 250 -2 Definitions. 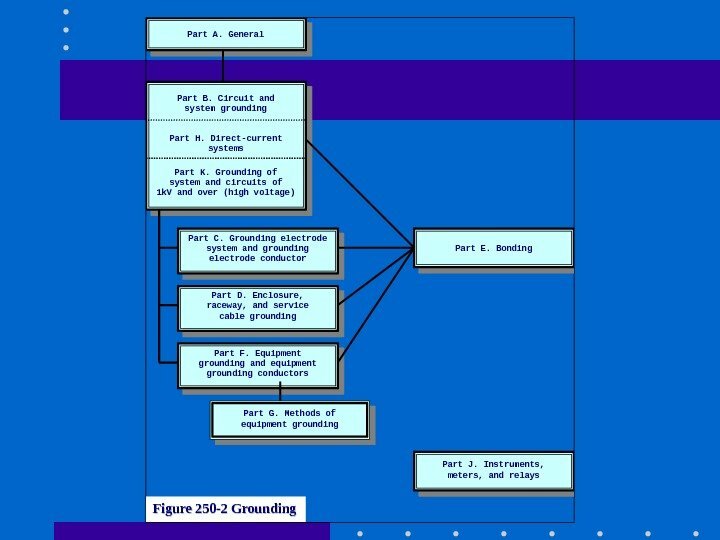 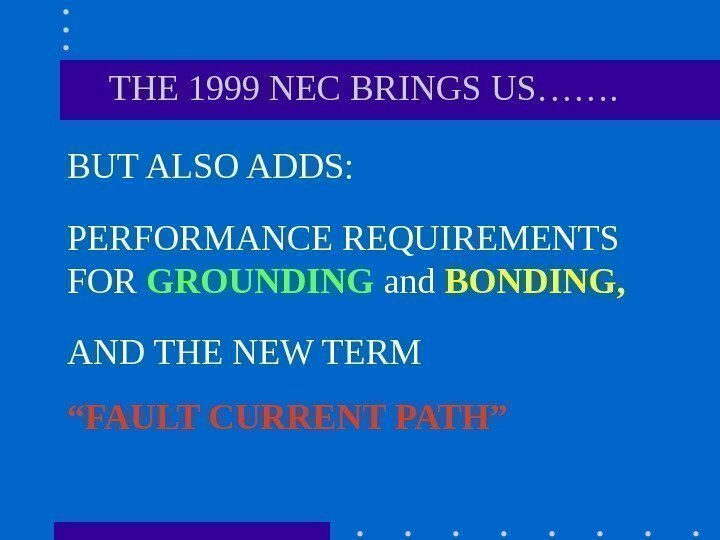 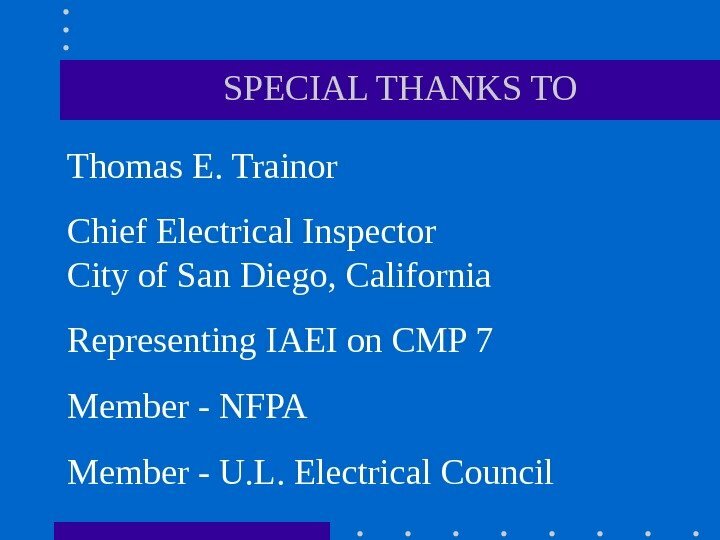 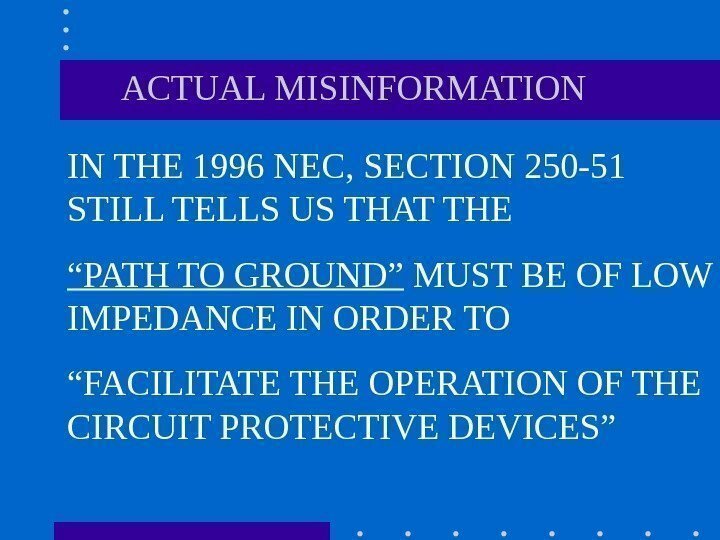 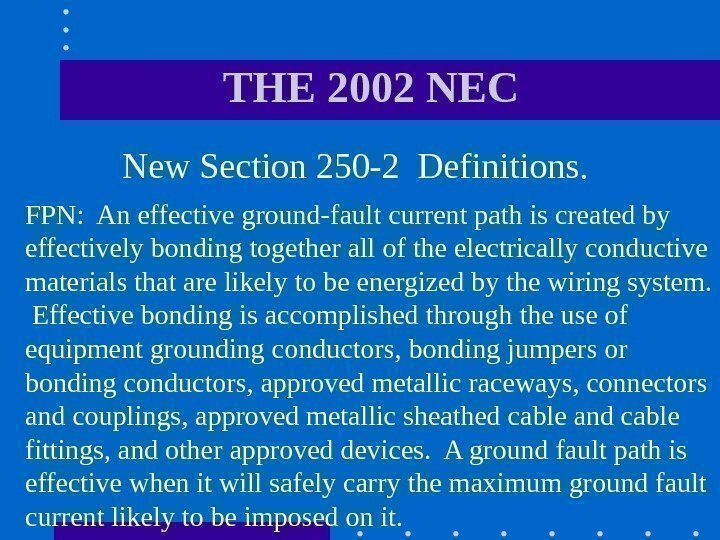 FPN: Examples of ground-fault current paths could consist of any combination of equipment grounding conductors, metallic raceways, metallic cable sheaths, electrical equipment, and any other electrically conductive material such as metal water and gas piping, steel framing members, stucco mesh, metal ducting, reinforcing steel, shields of communication cables and the earth itself. 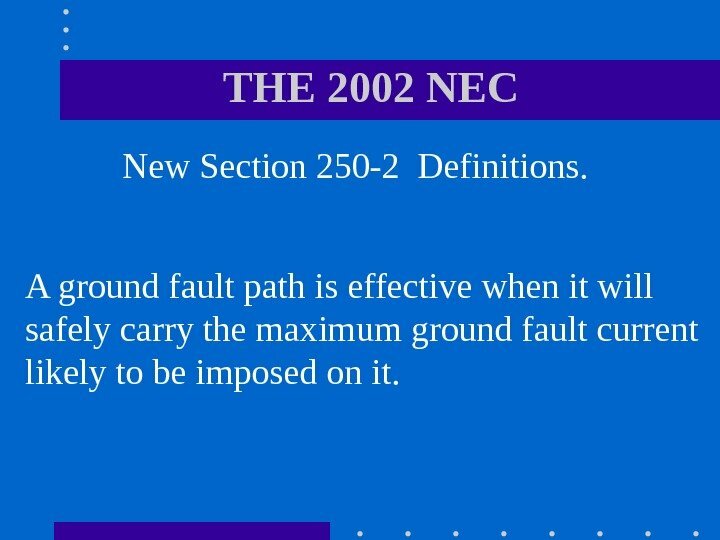 THE 2002 NEC New Section 250 -2 Definitions. 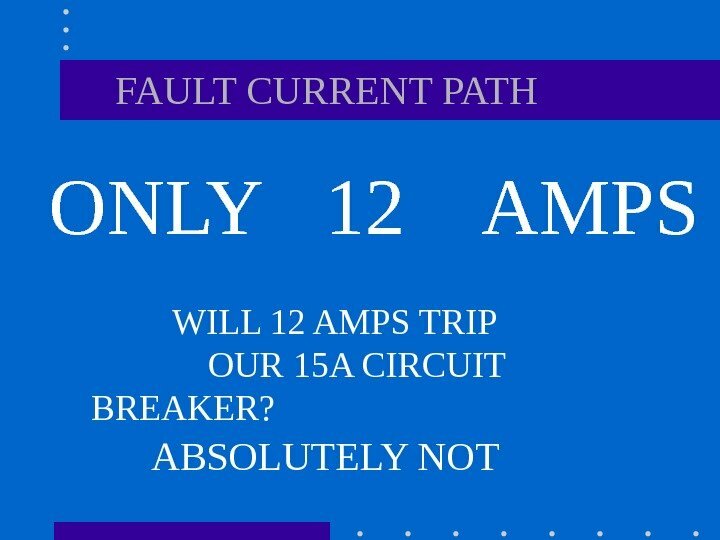 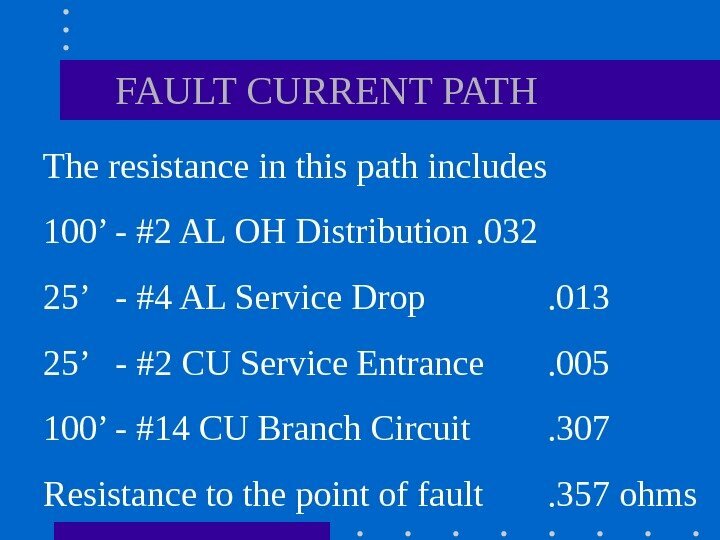 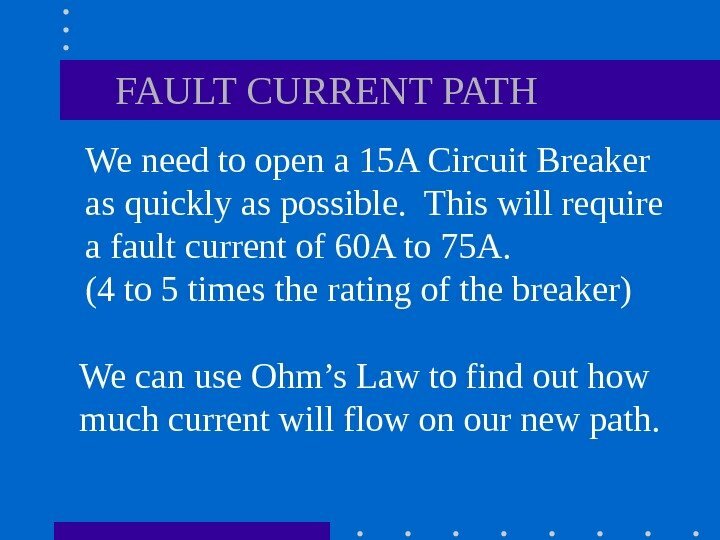 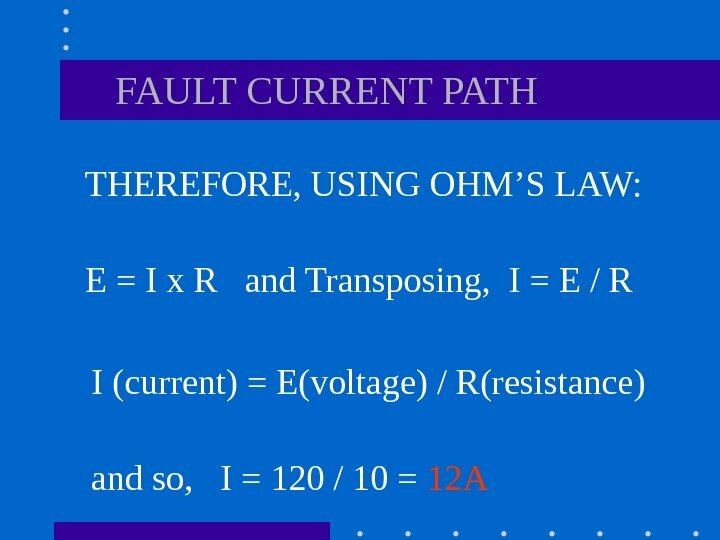 Effective Ground-Fault Current Path. 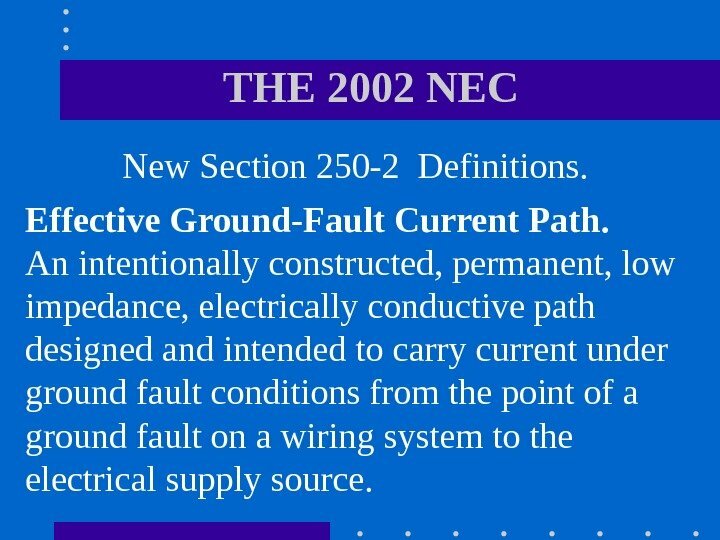 An intentionally constructed, permanent, low impedance, electrically conductive path designed and intended to carry current under ground fault conditions from the point of a ground fault on a wiring system to the electrical supply source. 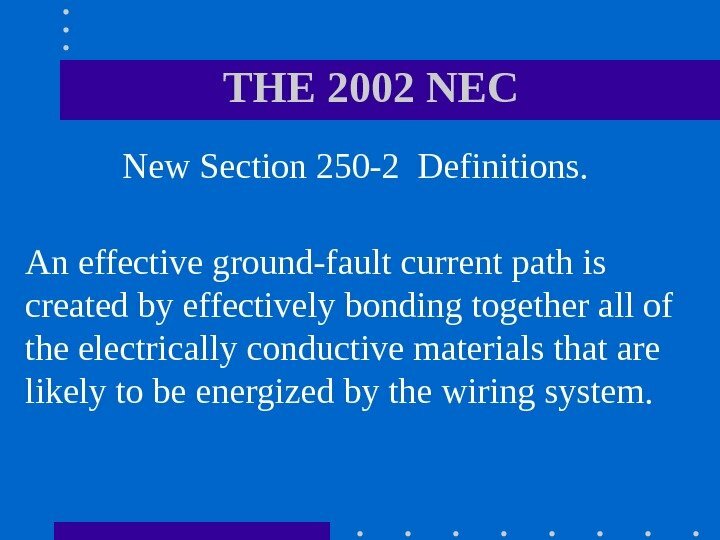 THE 2002 NEC New Section 250 -2 Definitions. 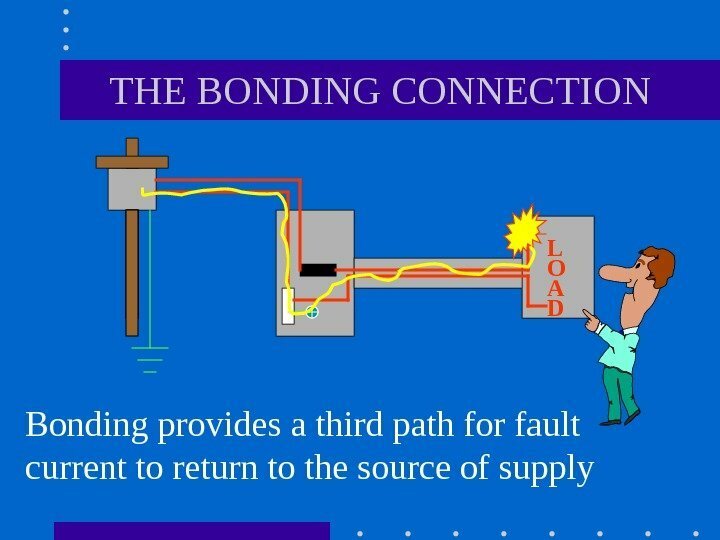 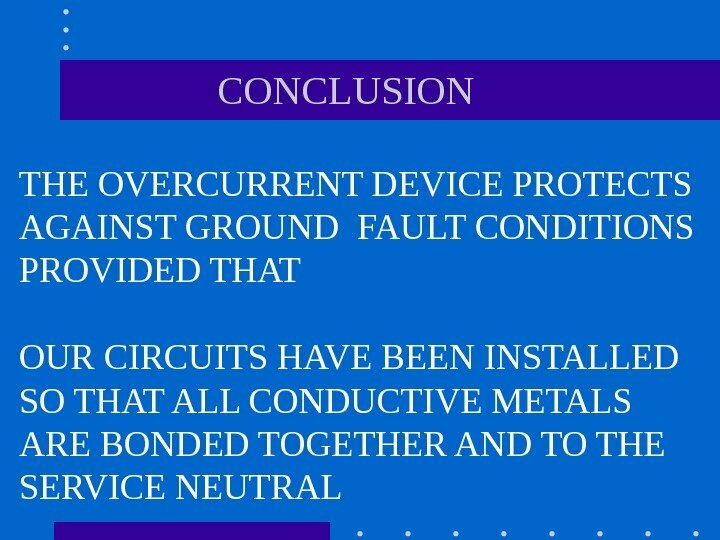 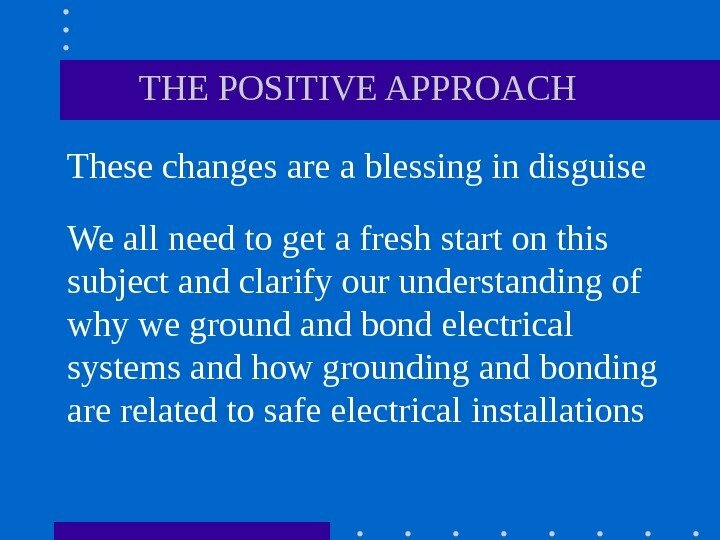 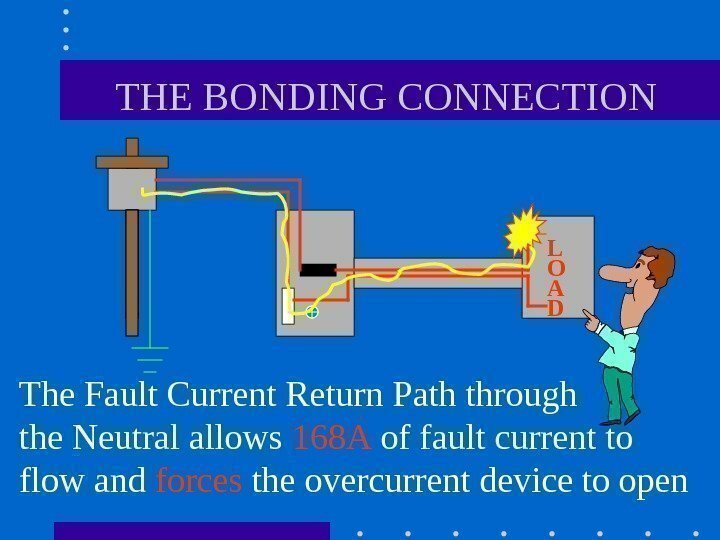 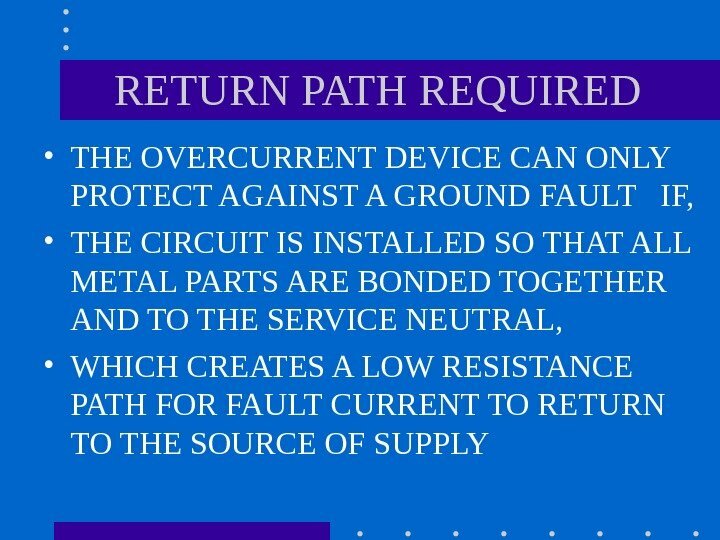 FPN: An effective ground-fault current path is created by effectively bonding together all of the electrically conductive materials that are likely to be energized by the wiring system. 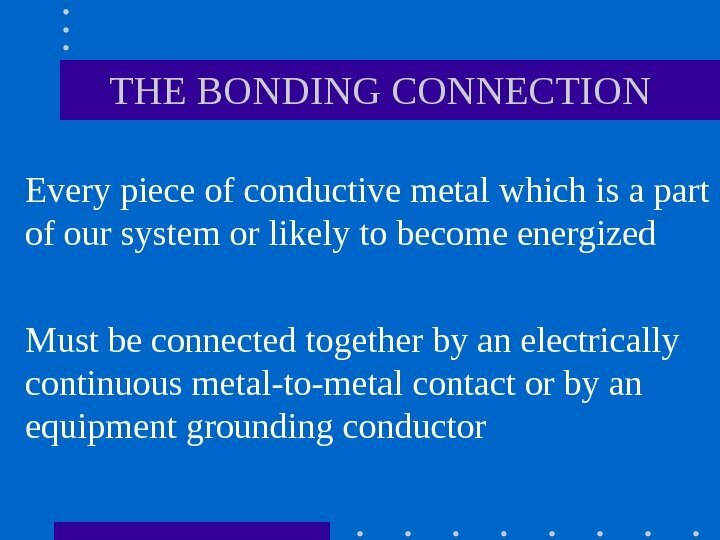 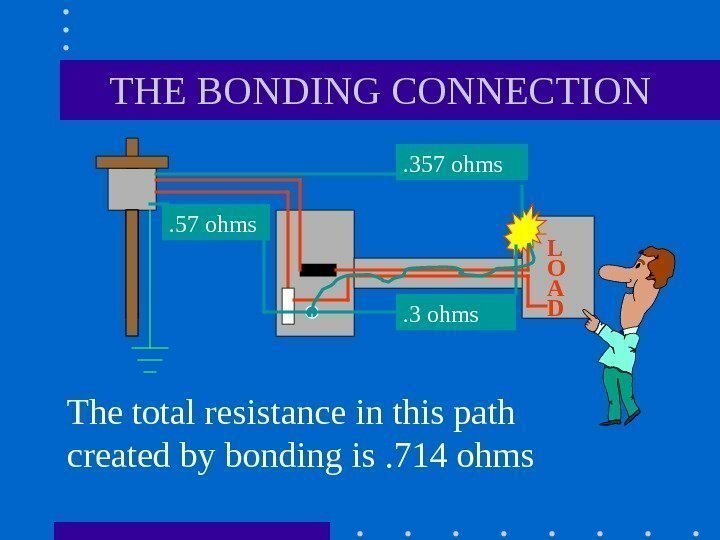 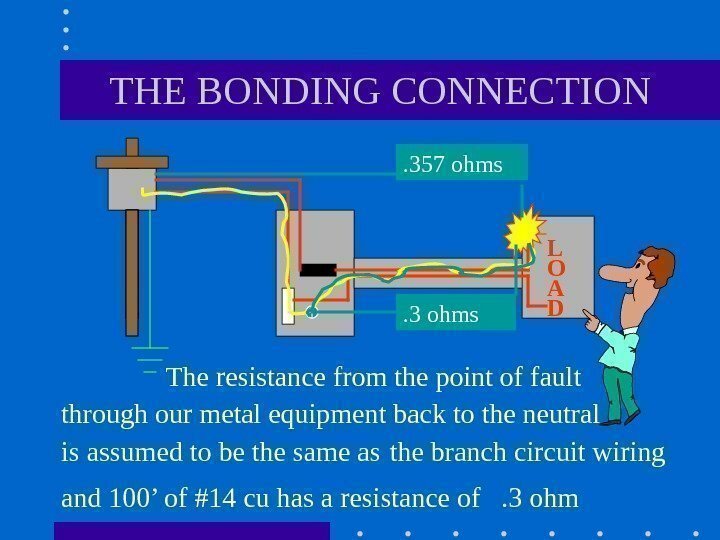 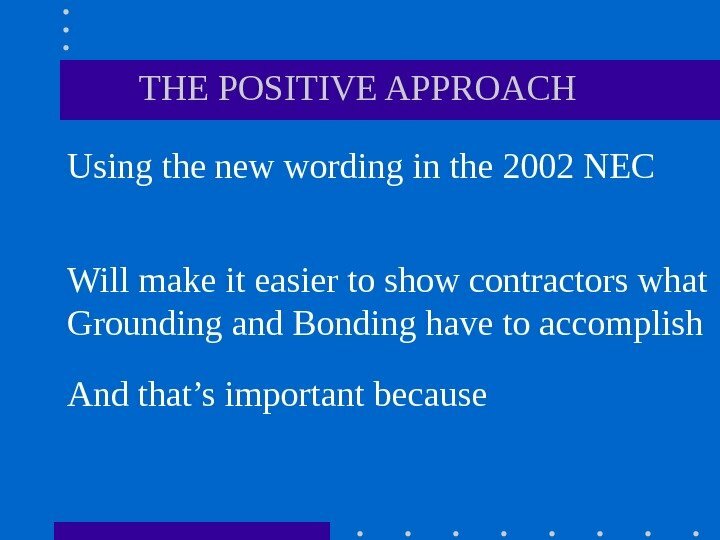 Effective bonding is accomplished through the use of equipment grounding conductors, bonding jumpers or bonding conductors, approved metallic raceways, connectors and couplings, approved metallic sheathed cable and cable fittings, and other approved devices. 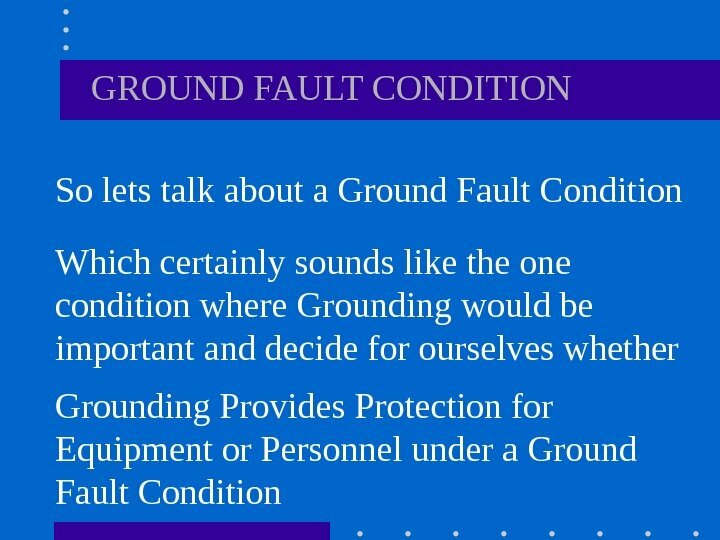 A ground fault path is effective when it will safely carry the maximum ground fault current likely to be imposed on it. 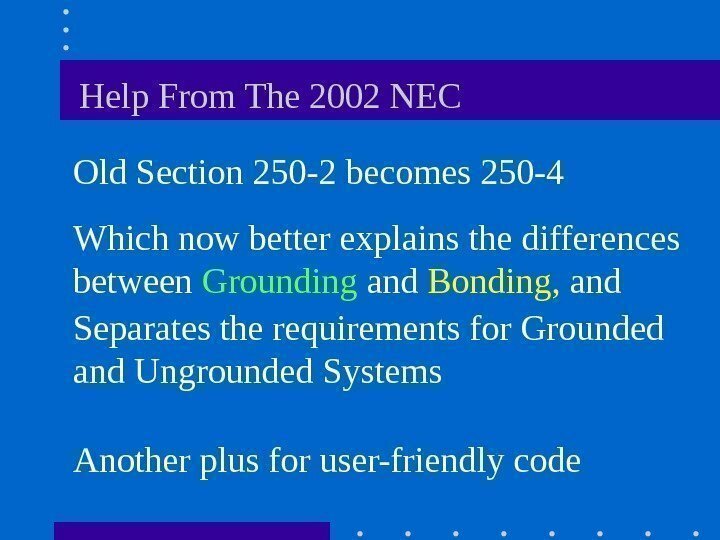 THE 2002 NEC New Section 250 -2 Definitions. 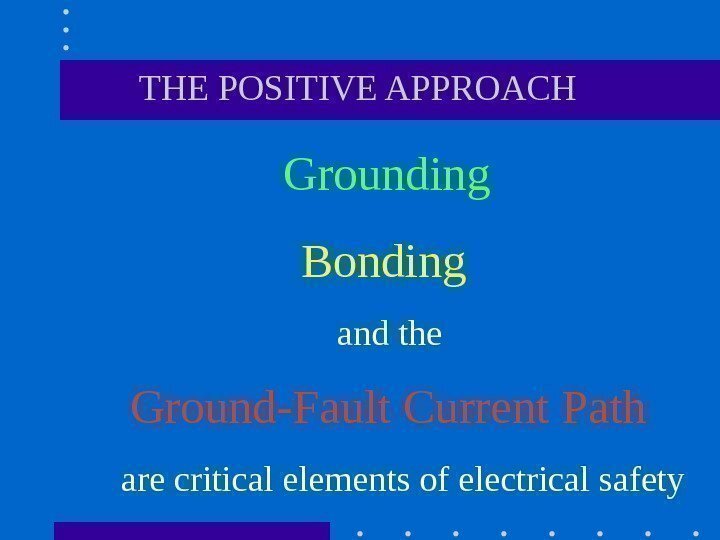 An effective ground-fault current path is created by effectively bonding together all of the electrically conductive materials that are likely to be energized by the wiring system. 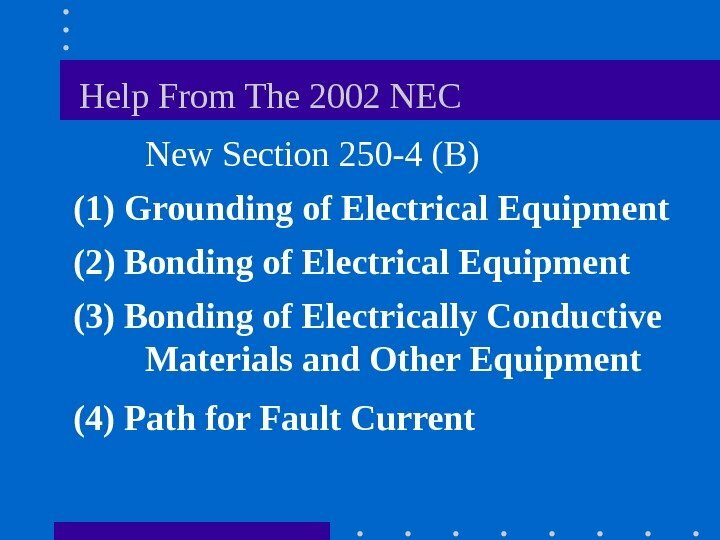 THE 2002 NEC New Section 250 -2 Definitions. 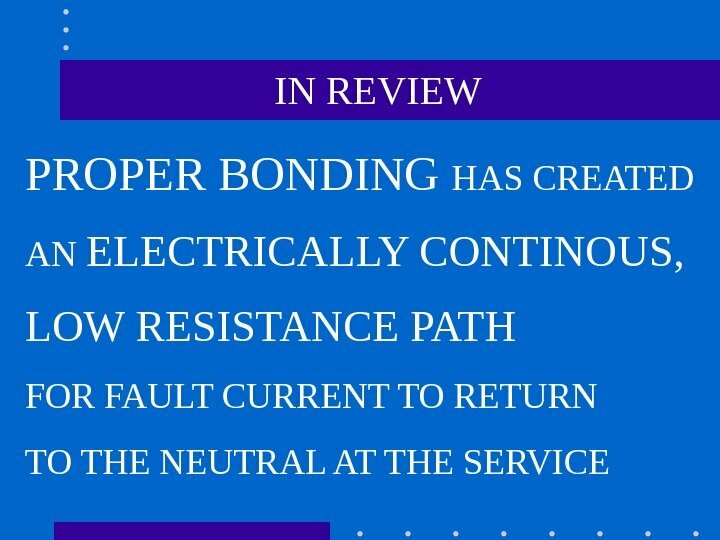 Effective bonding is accomplished through the use of equipment grounding conductors, bonding jumpers or bonding conductors, approved metallic raceways, connectors and couplings, approved metallic sheathed cable and cable fittings, and other approved devices. 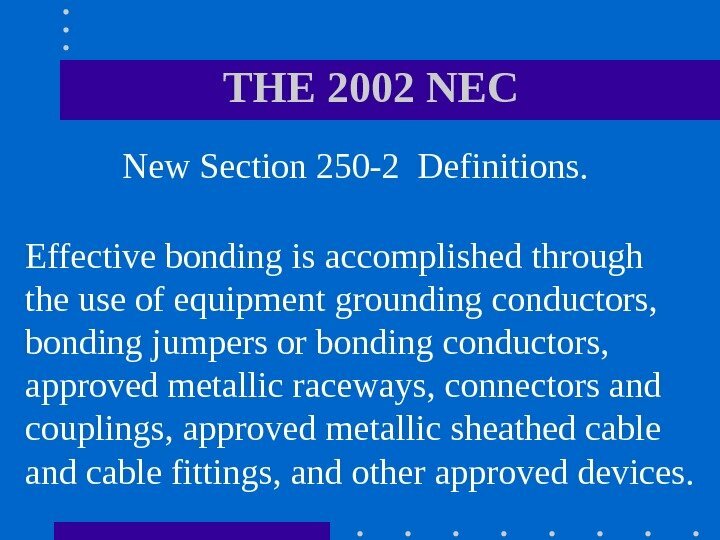 THE 2002 NEC New Section 250 -2 Definitions. A ground fault path is effective when it will safely carry the maximum ground fault current likely to be imposed on it. 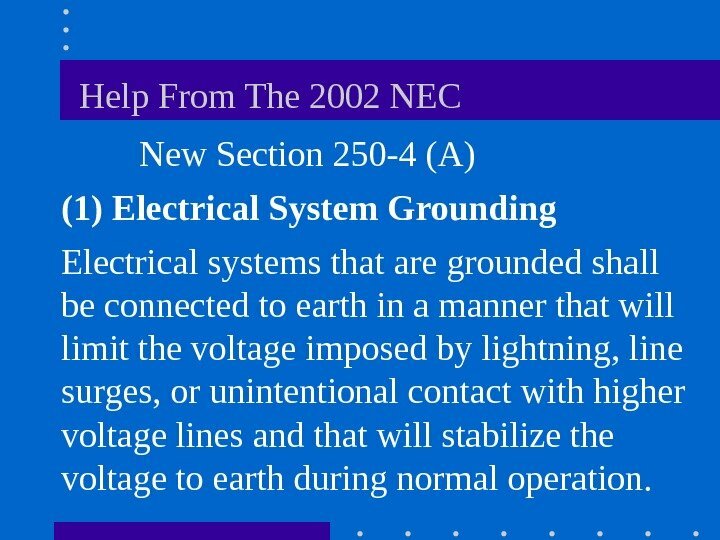 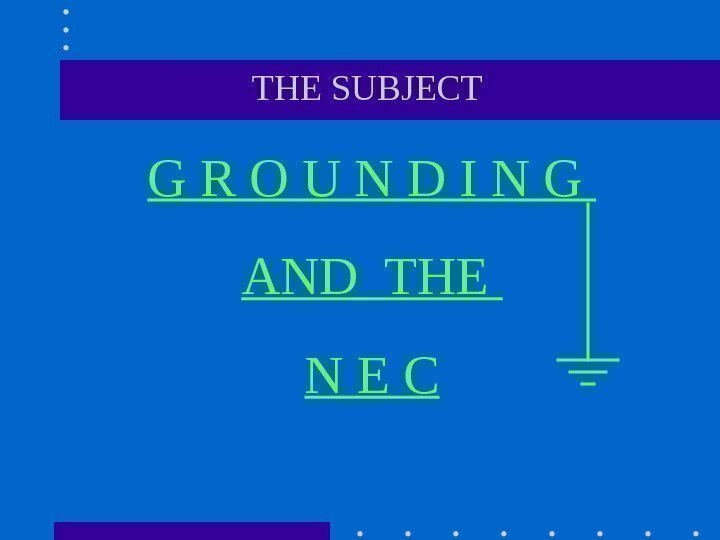 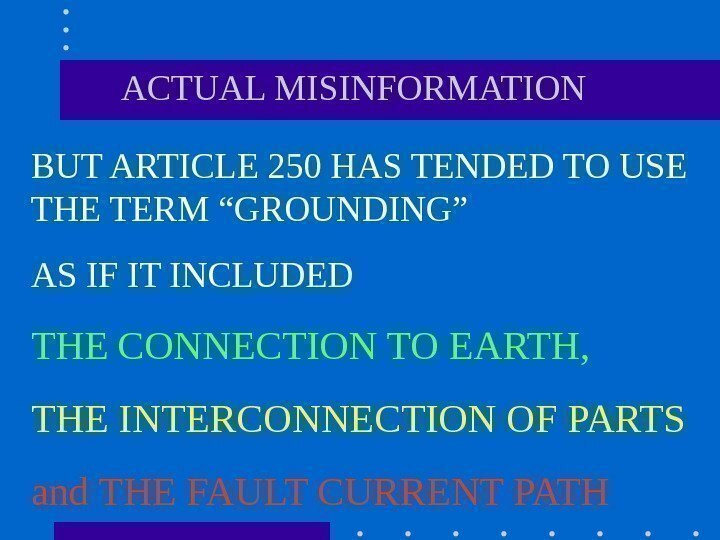 Help From The 2002 NEC New Section 250 -4 (A) (1) Electrical System Grounding Electrical systems that are grounded shall be connected to earth in a manner that will limit the voltage imposed by lightning, line surges, or unintentional contact with higher voltage lines and that will stabilize the voltage to earth during normal operation. 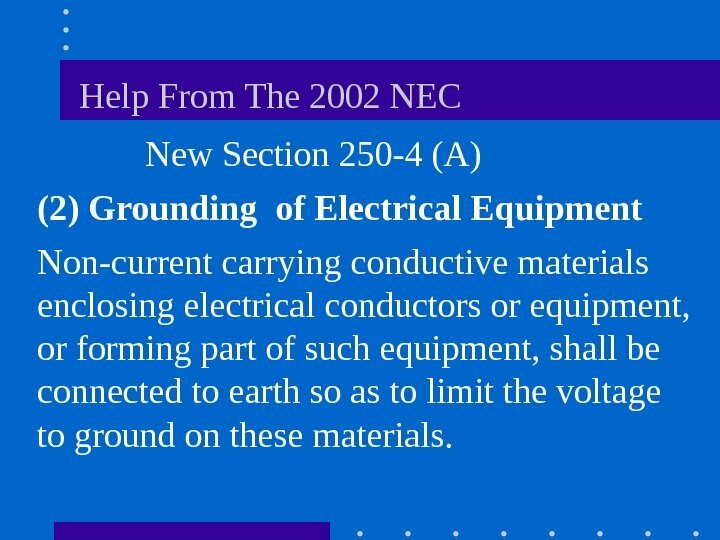 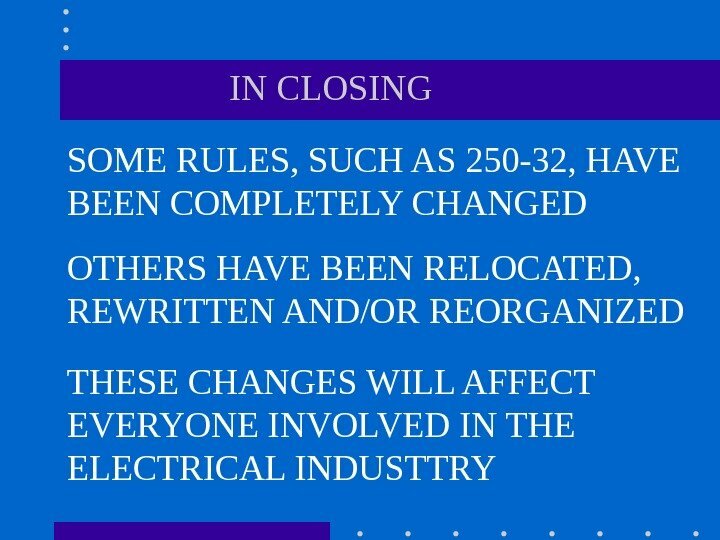 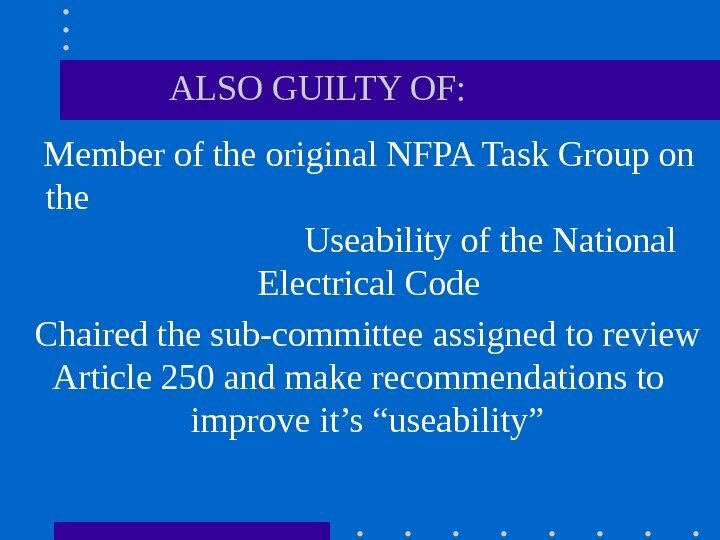 Help From The 2002 NEC New Section 250 -4 (A) (2) Grounding of Electrical Equipment Non-current carrying conductive materials enclosing electrical conductors or equipment, or forming part of such equipment, shall be connected to earth so as to limit the voltage to ground on these materials. 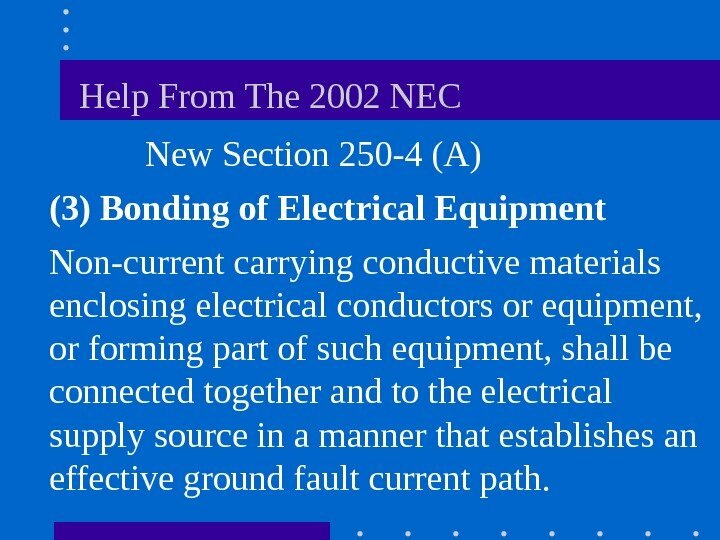 Help From The 2002 NEC New Section 250 -4 (A) (3) Bonding of Electrical Equipment Non-current carrying conductive materials enclosing electrical conductors or equipment, or forming part of such equipment, shall be connected together and to the electrical supply source in a manner that establishes an effective ground fault current path. 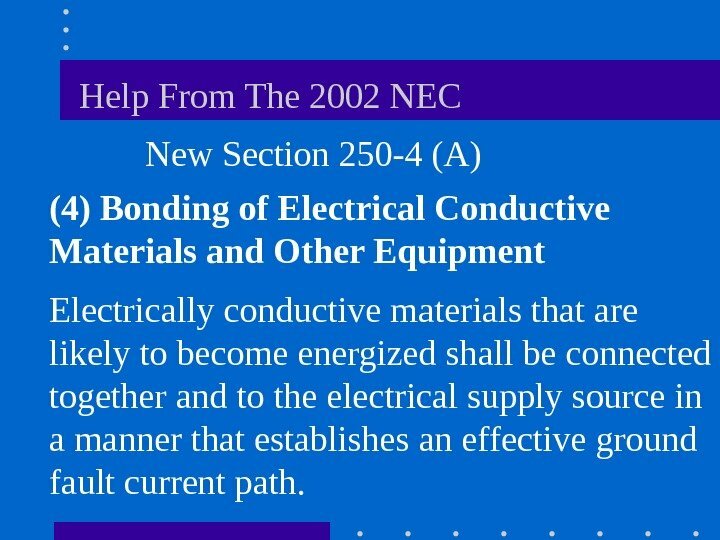 Help From The 2002 NEC New Section 250 -4 (A) (4) Bonding of Electrical Conductive Materials and Other Equipment Electrically conductive materials that are likely to become energized shall be connected together and to the electrical supply source in a manner that establishes an effective ground fault current path. 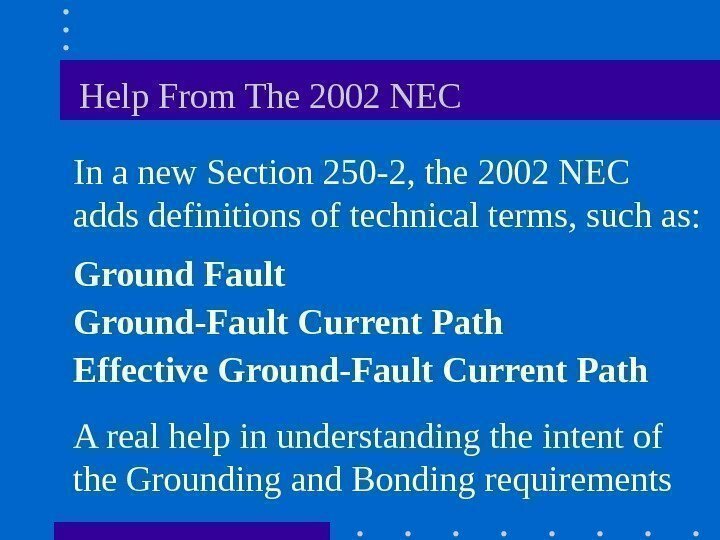 Help From The 2002 NEC New Section 250 -4 (A) (5) Effective Ground Fault Current Path Electrical equipment and wiring and other electrically conductive material likely to become energized shall be installed in a manner that creates a permanent, low impedance circuit capable of safely carrying the maximum ground fault current likely to be imposed on it from any point on the wiring system where a ground fault may occur to the electrical supply source. 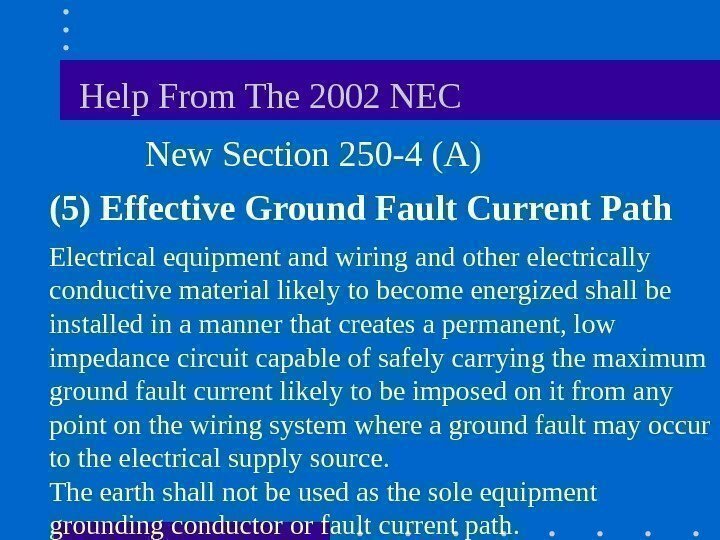 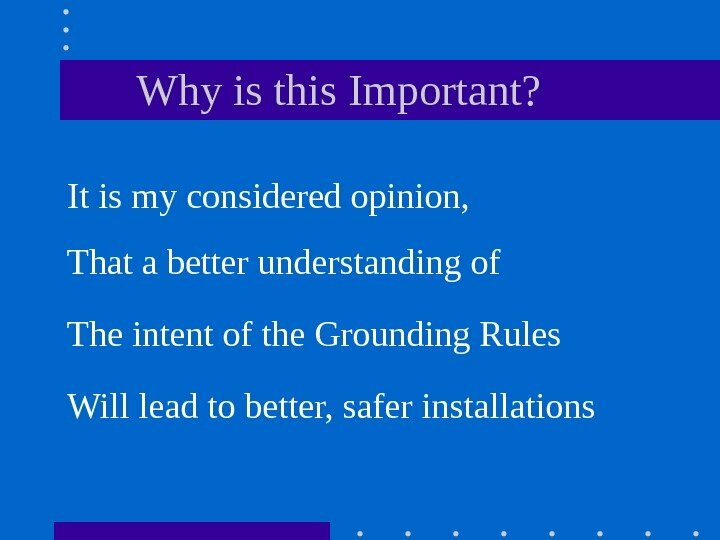 The earth shall not be used as the sole equipment grounding conductor or fault current path. 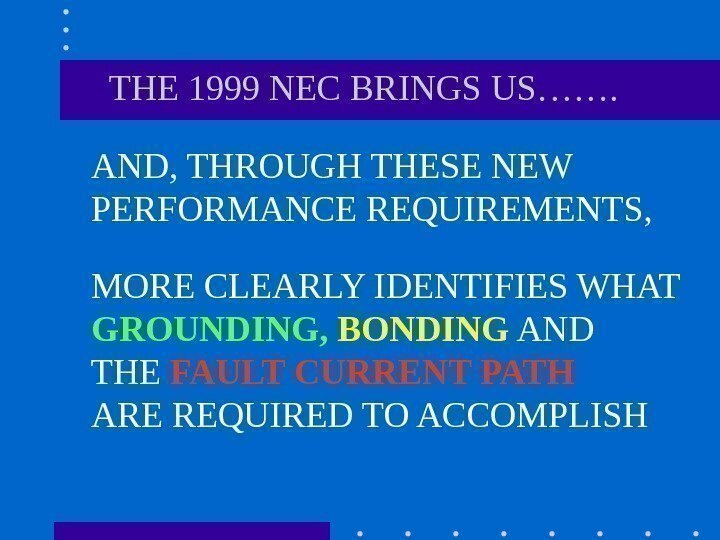 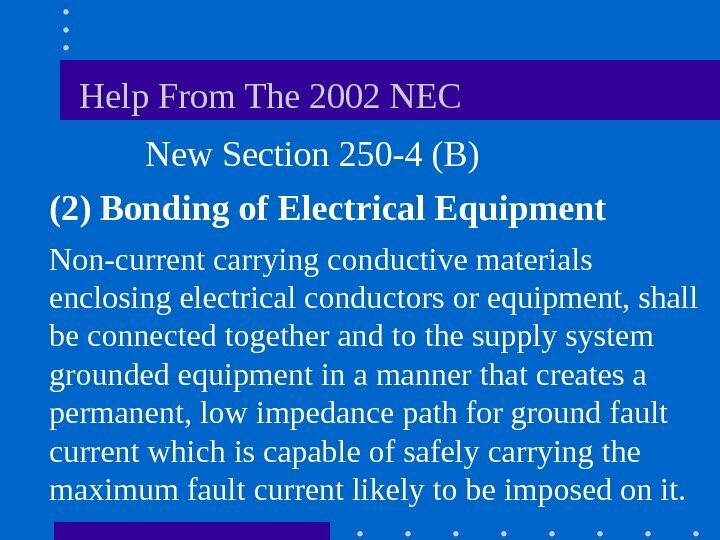 Help From The 2002 NEC New Section 250 -4 (B) (2) Bonding of Electrical Equipment Non-current carrying conductive materials enclosing electrical conductors or equipment, shall be connected together and to the supply system grounded equipment in a manner that creates a permanent, low impedance path for ground fault current which is capable of safely carrying the maximum fault current likely to be imposed on it. 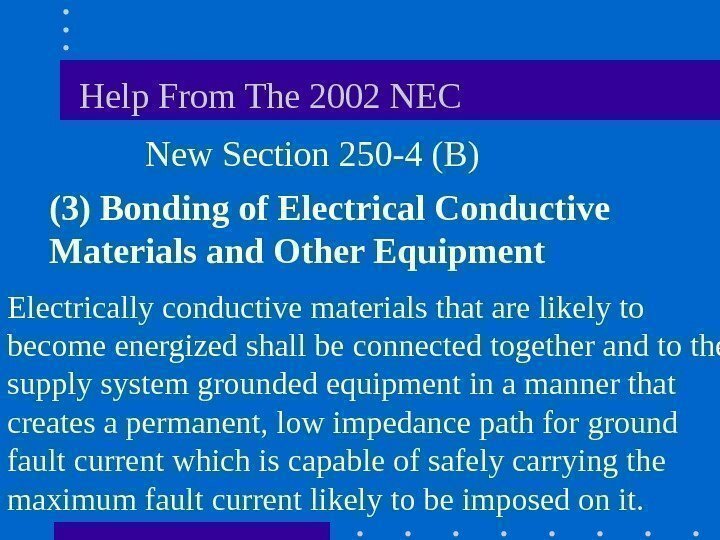 Help From The 2002 NEC New Section 250 -4 (B) (3) Bonding of Electrical Conductive Materials and Other Equipment Electrically conductive materials that are likely to become energized shall be connected together and to the supply system grounded equipment in a manner that creates a permanent, low impedance path for ground fault current which is capable of safely carrying the maximum fault current likely to be imposed on it. 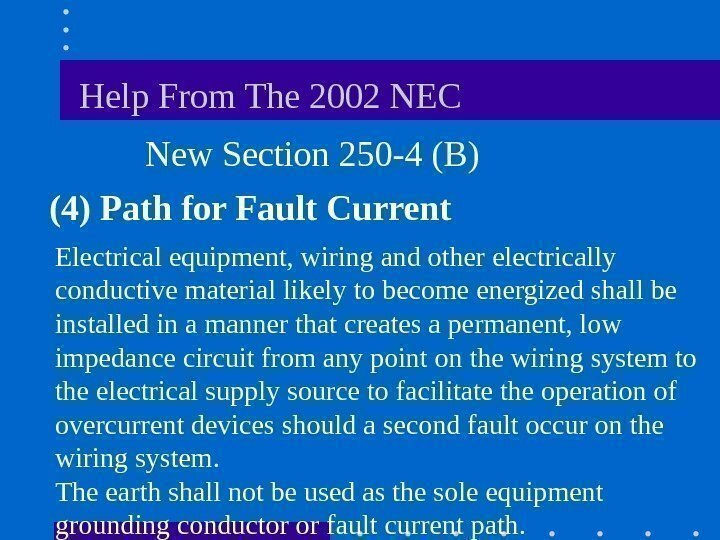 Help From The 2002 NEC New Section 250 -4 (B) (4) Path for Fault Current Electrical equipment, wiring and other electrically conductive material likely to become energized shall be installed in a manner that creates a permanent, low impedance circuit from any point on the wiring system to the electrical supply source to facilitate the operation of overcurrent devices should a second fault occur on the wiring system. 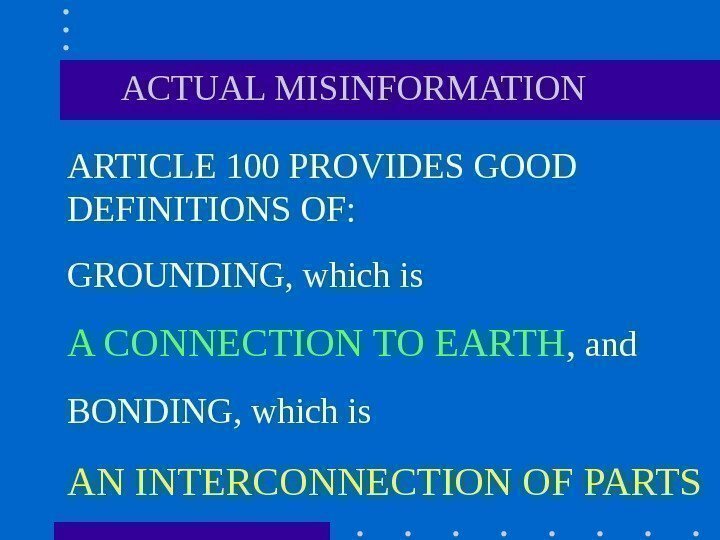 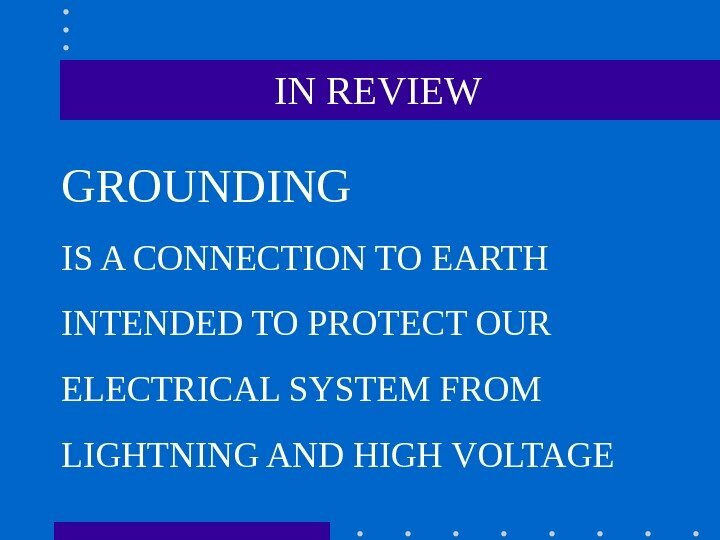 The earth shall not be used as the sole equipment grounding conductor or fault current path.